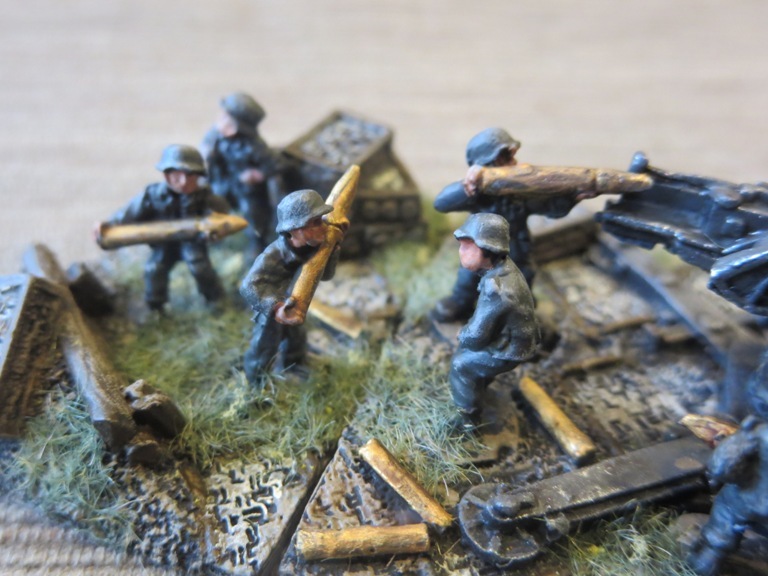 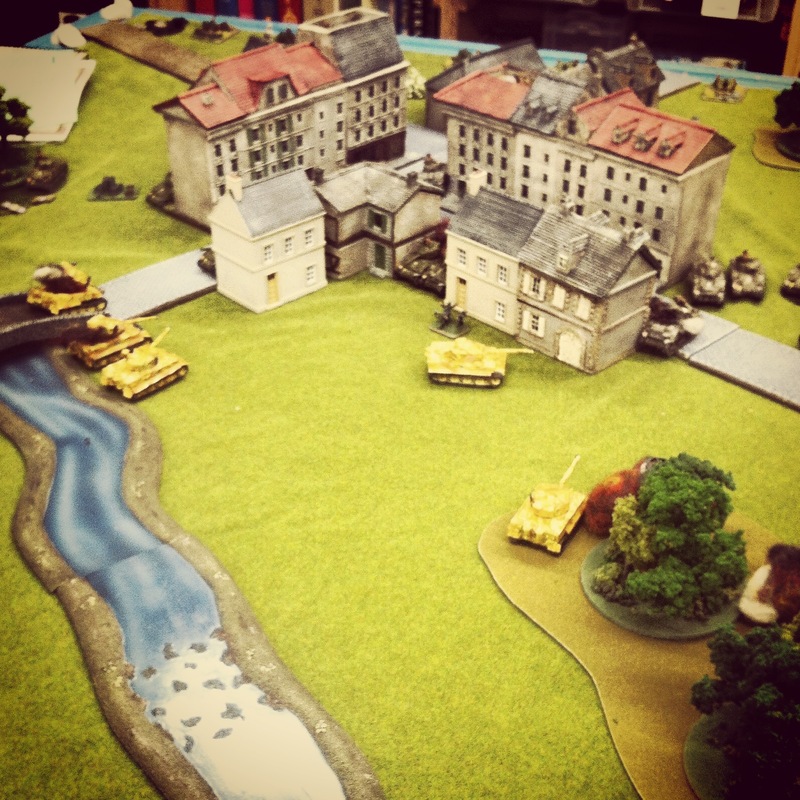 Taking advantage of a renewed interest in the popular Flames of War 15mm miniatures WWII wargame, Metropolitan Wargamers in Park Slope, Brooklyn hosted a big day of gaming this past weekend. 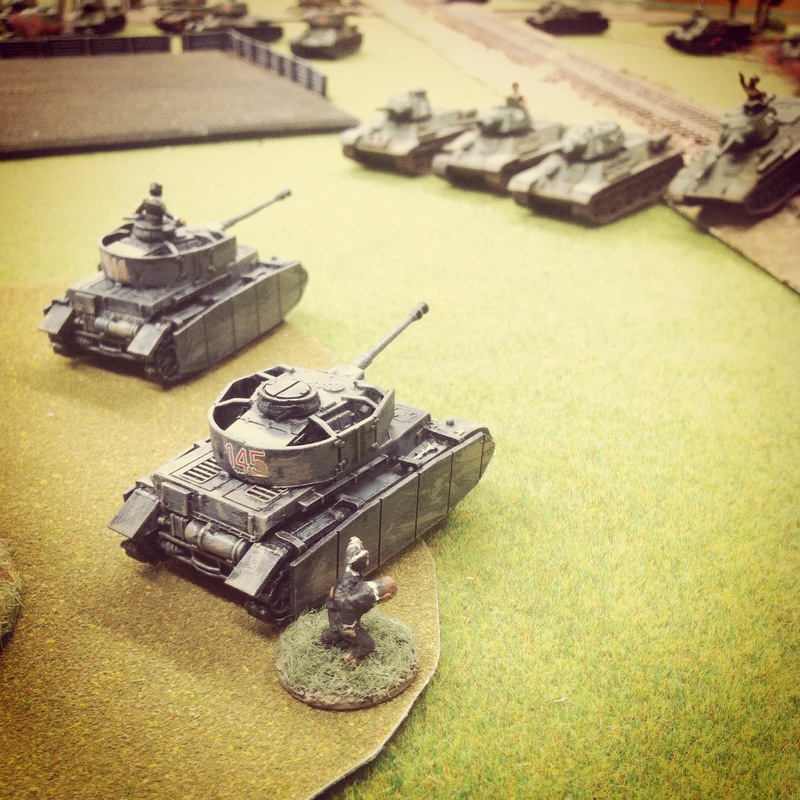 Both experienced and new players alike came together on two of the club’s largest tables to play to big scenarios over the better part of Saturday afternoon. 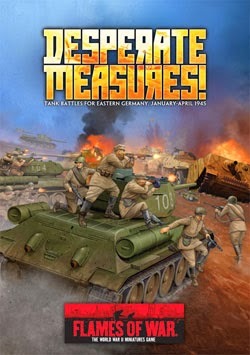 I mention it often, but the amazing group of people who make up the Metropolitan Wargamers club bears mentioning again. 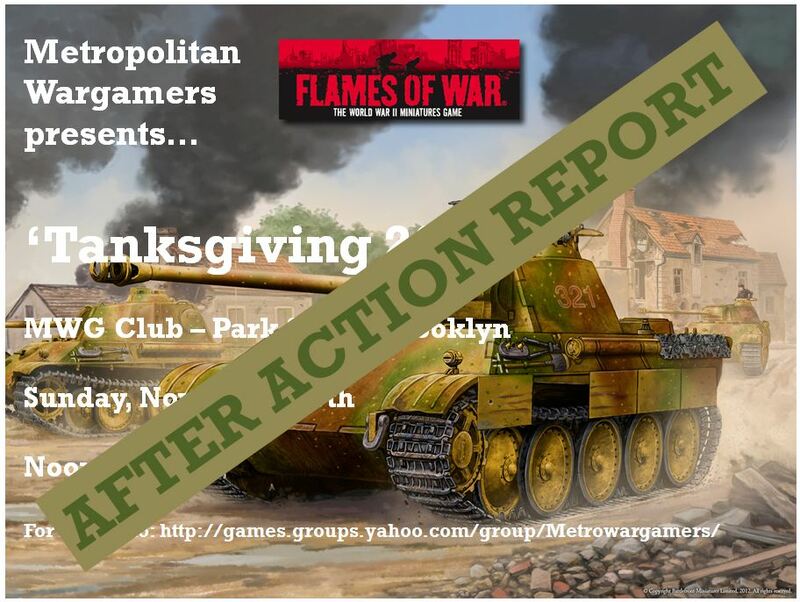 The club will celebrate its 20th anniversary next year, and it’s a real gamers paradise for those of us living in New York City. 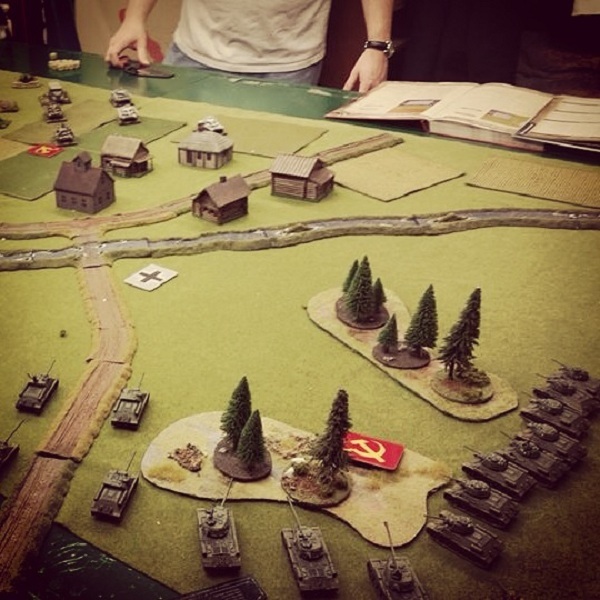 Visitors and a core group of long-time members drop by the club throughout the week and engage in all manner of games, from boardgame favorites and card games to large scale historical miniatures battles and grand strategic campaigns. 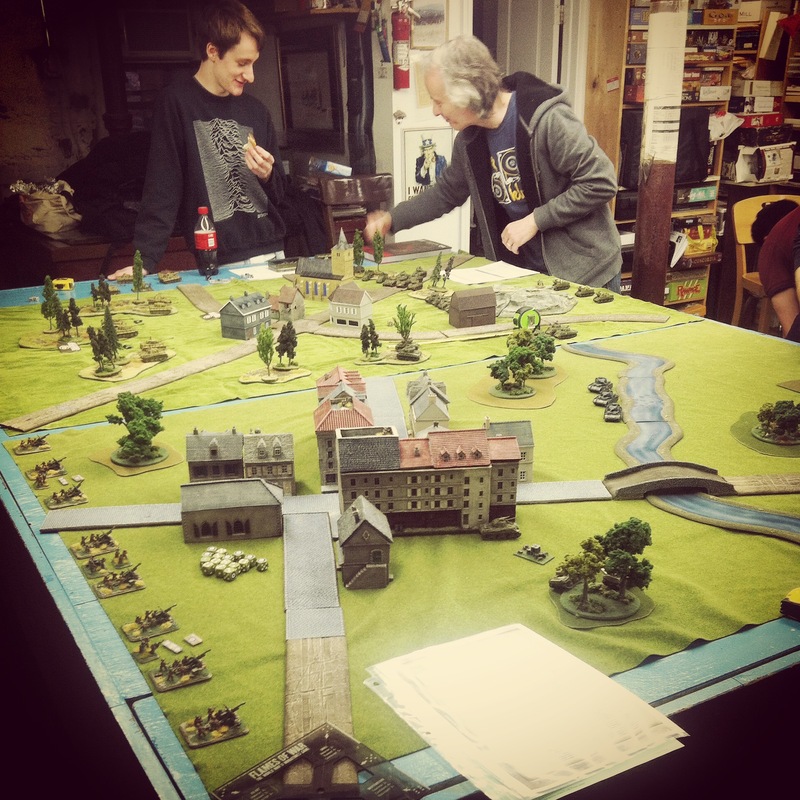 The club’s space occupies an entire basement-level of a typical Brooklyn rowhouse and is lined with shelves full of games and miniatures collected by members over two decades. 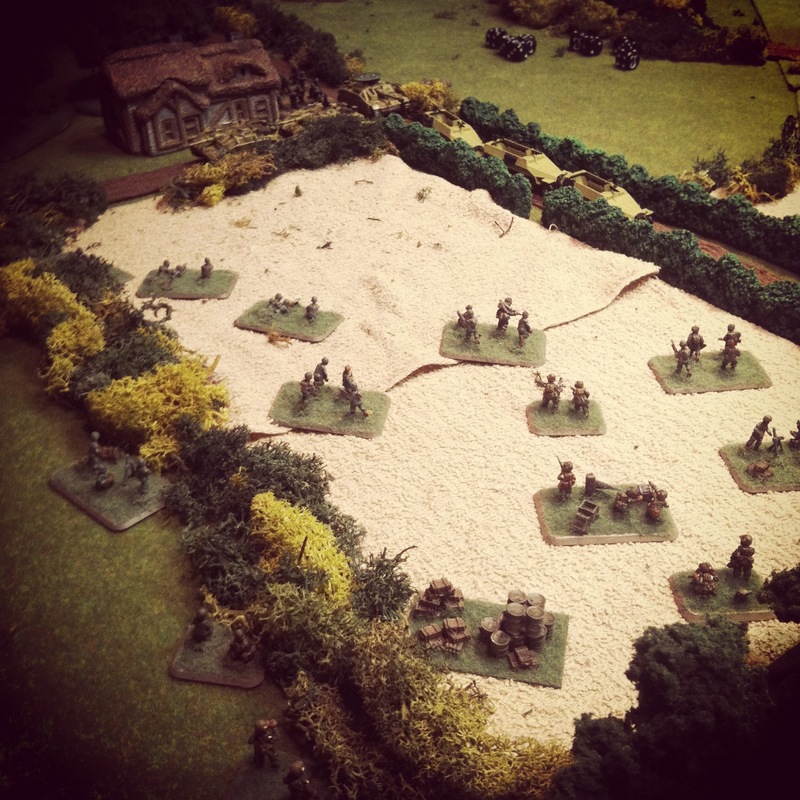 Playing space includes a number of the club’s award-winning sand tables, regular tables and racks on which ongoing games can be stored as they are played out over the course of weeks or even months. 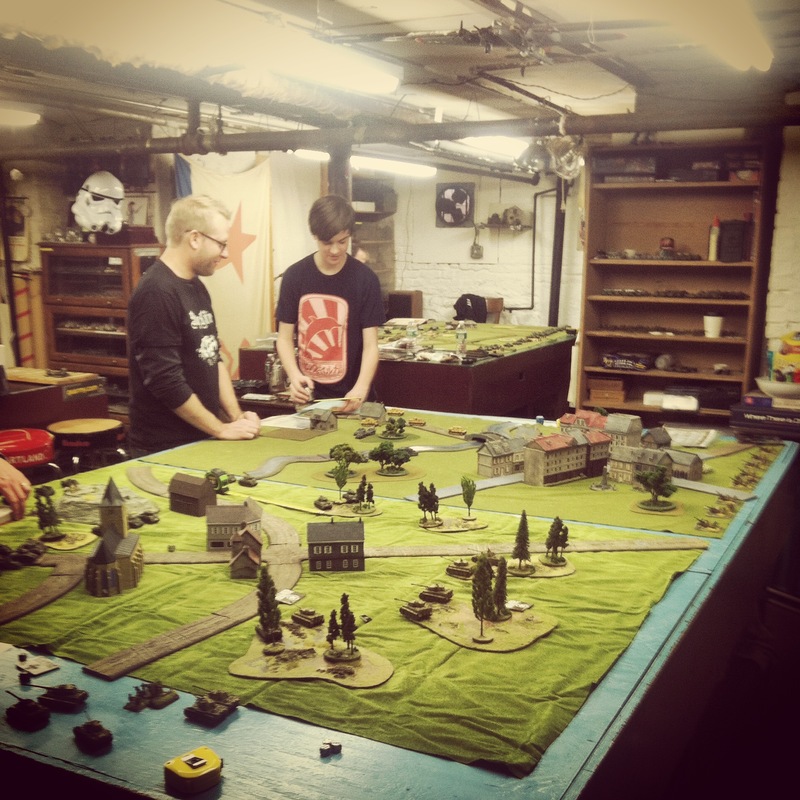 The club is an incredibly diverse and supportive environment for those of us who share our common passion in gaming. 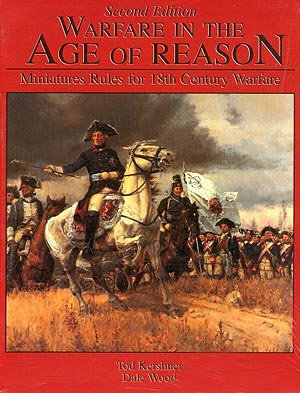 With 2014’s anniversary coming up, I hope to dedicate more space here in the near future with some history and perspectives from members. 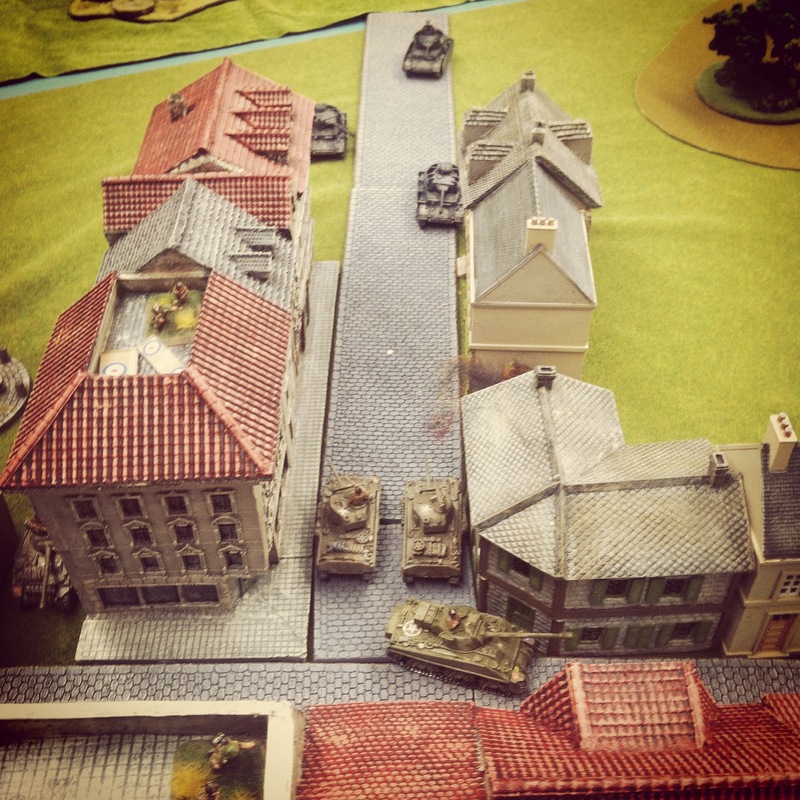 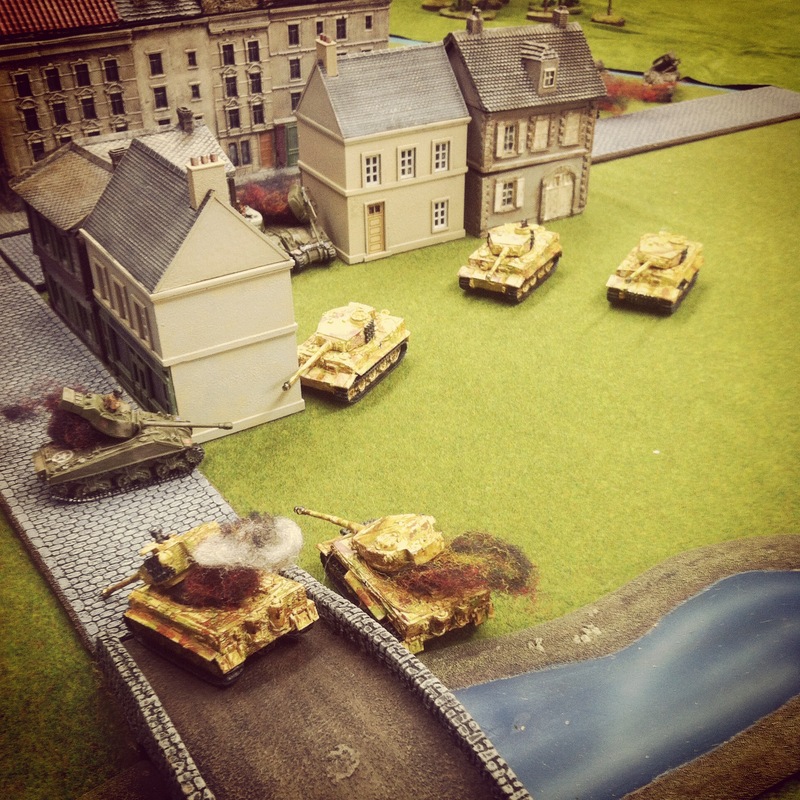 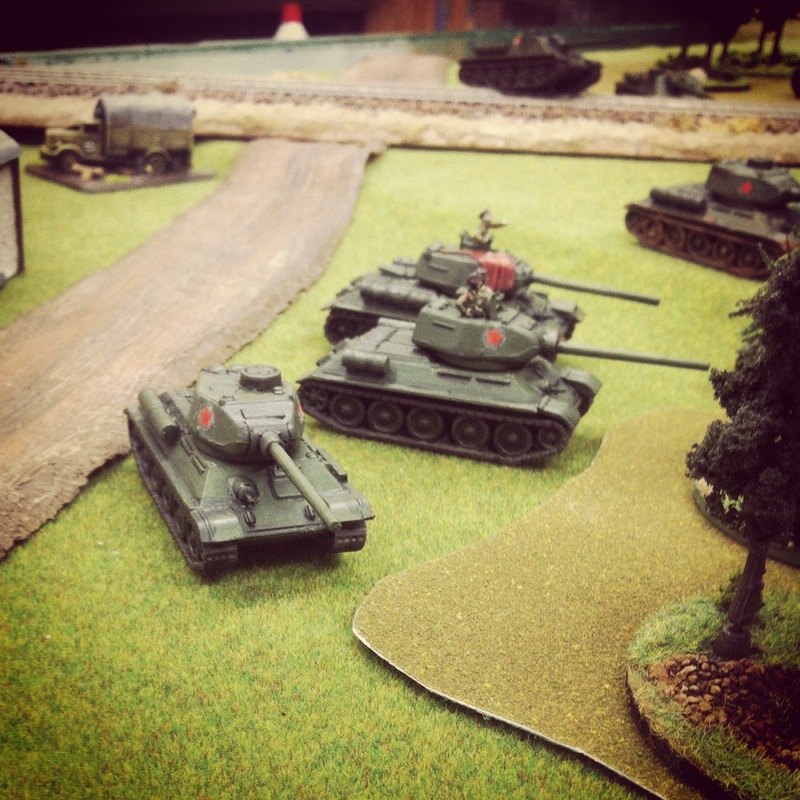 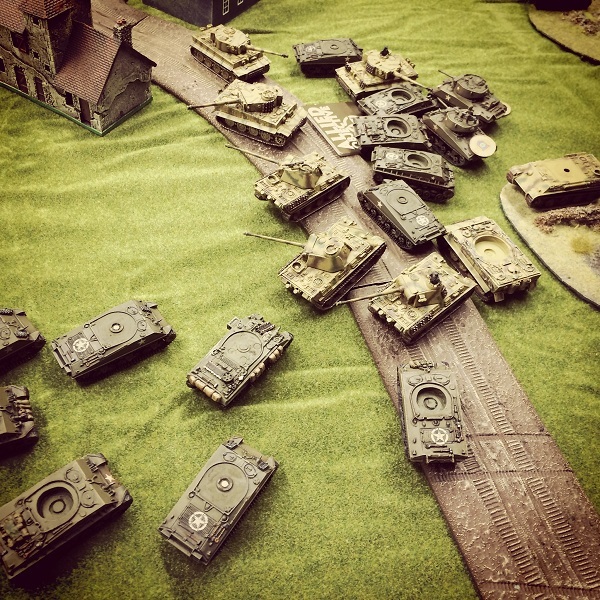 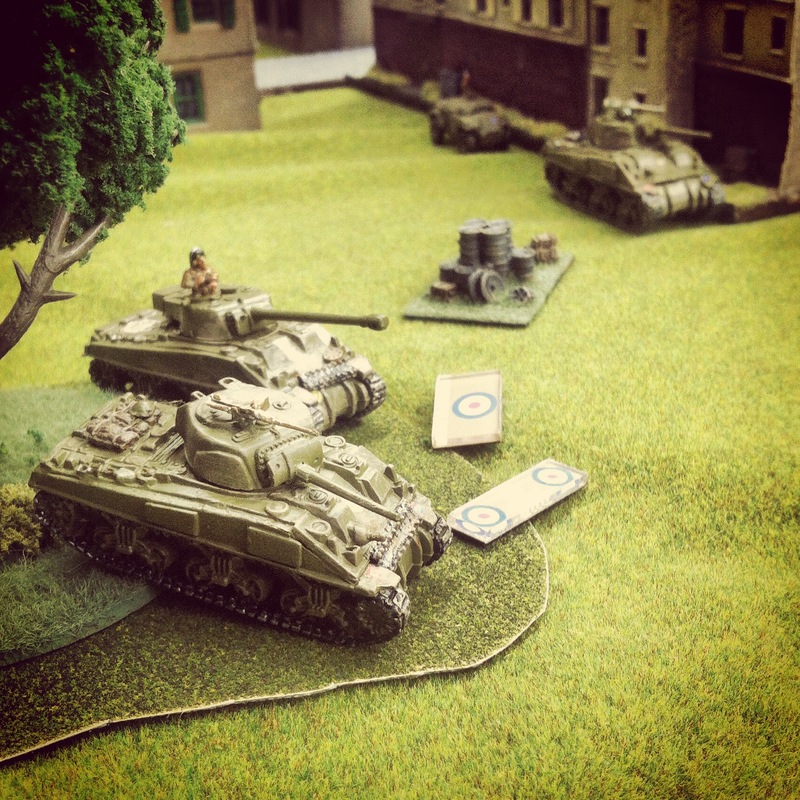 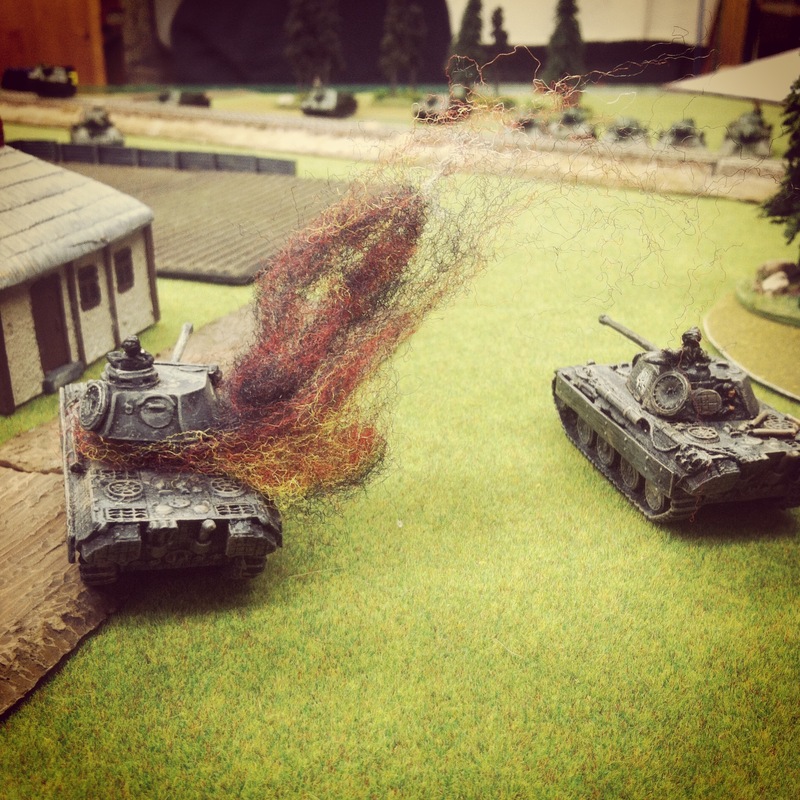 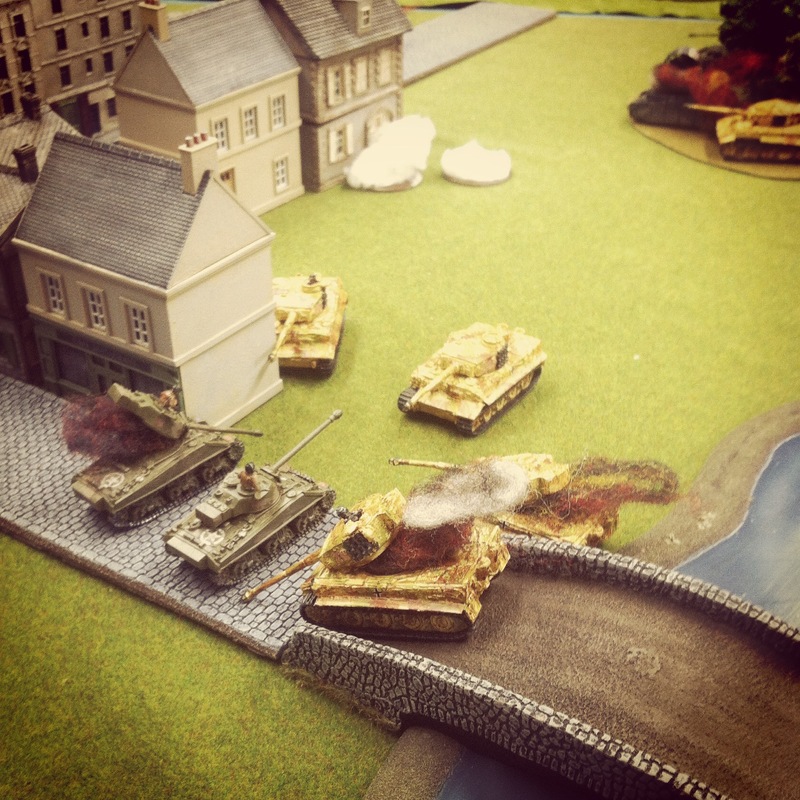 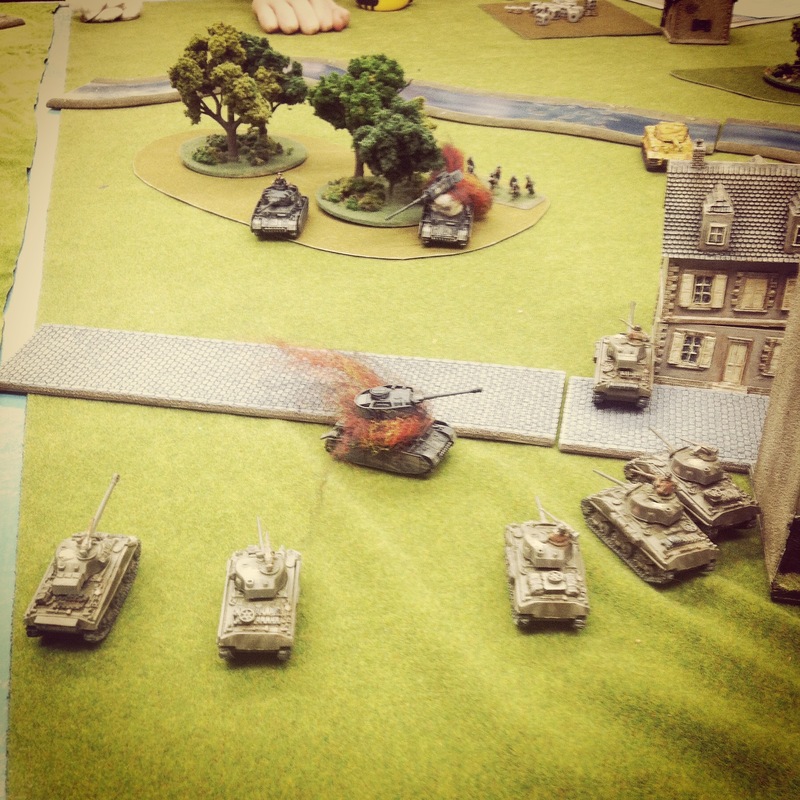 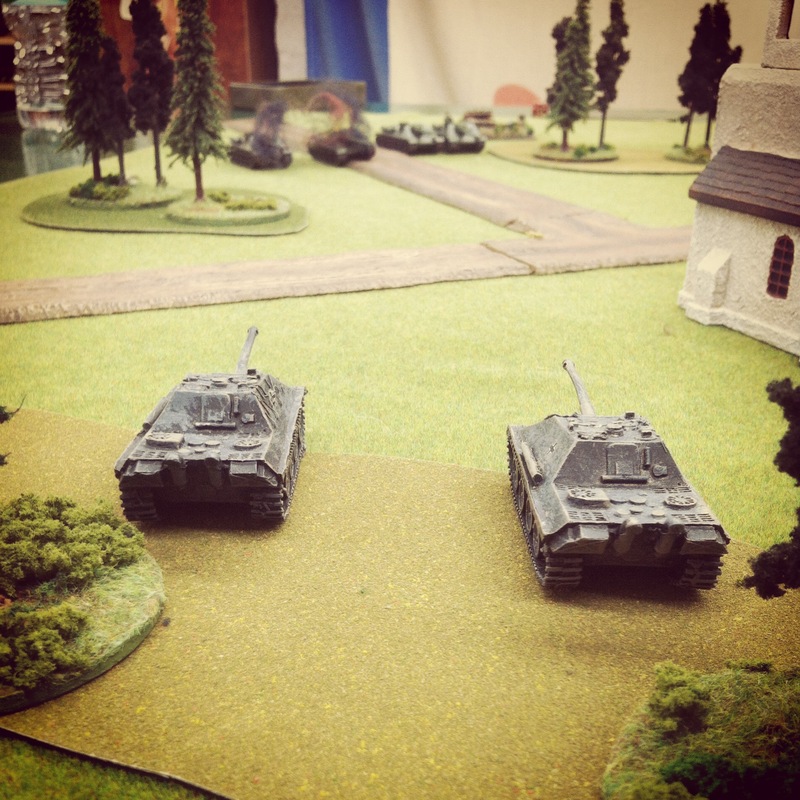 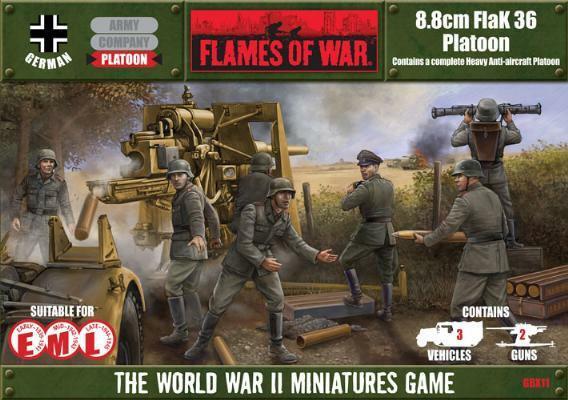 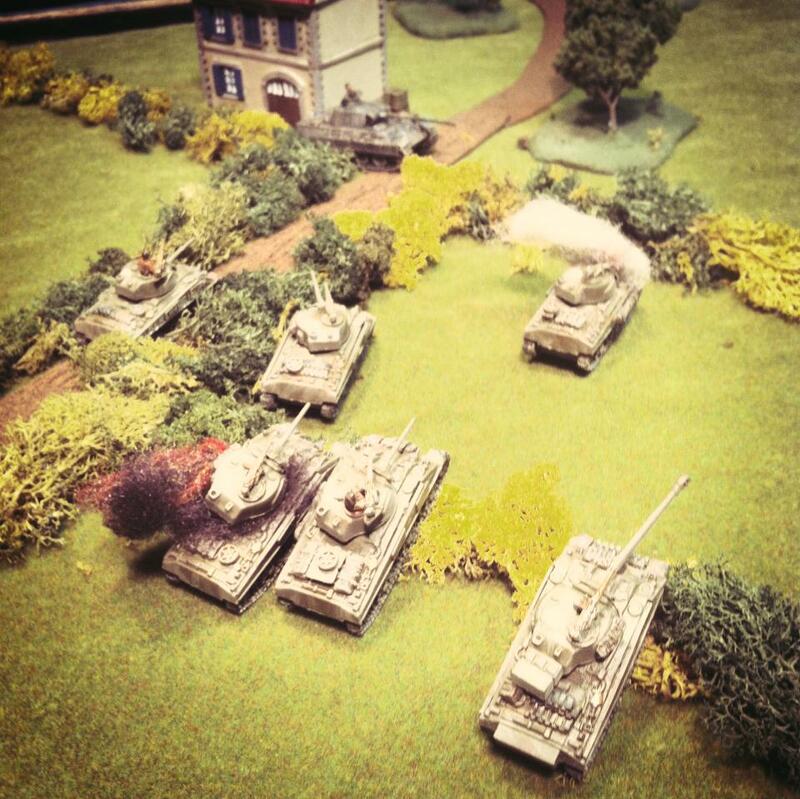 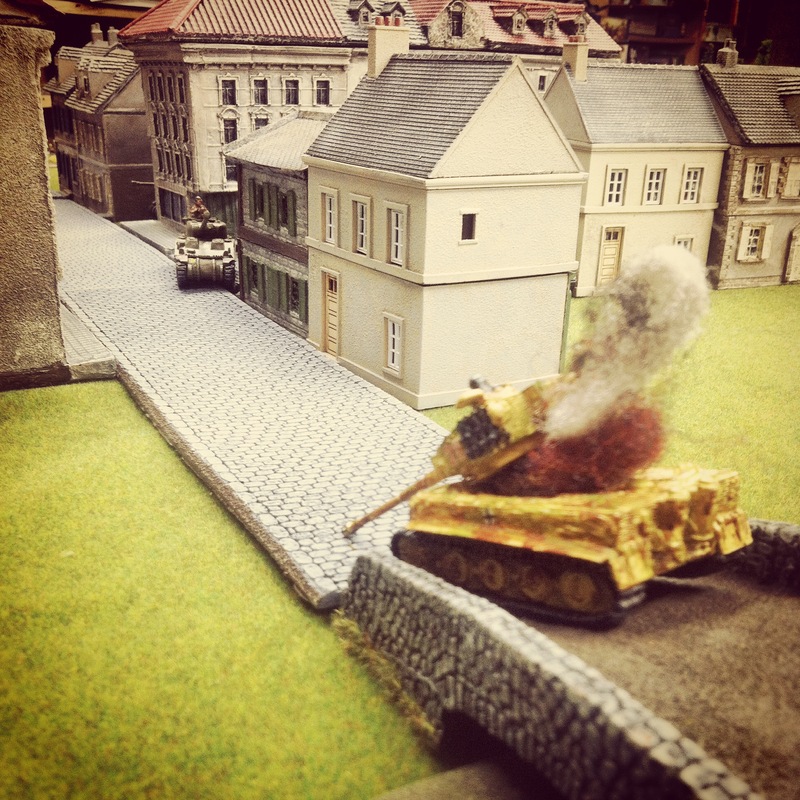 The folks at Flames of War provide special Total War rules for gaming large-scale matches like those we played this past weekend. 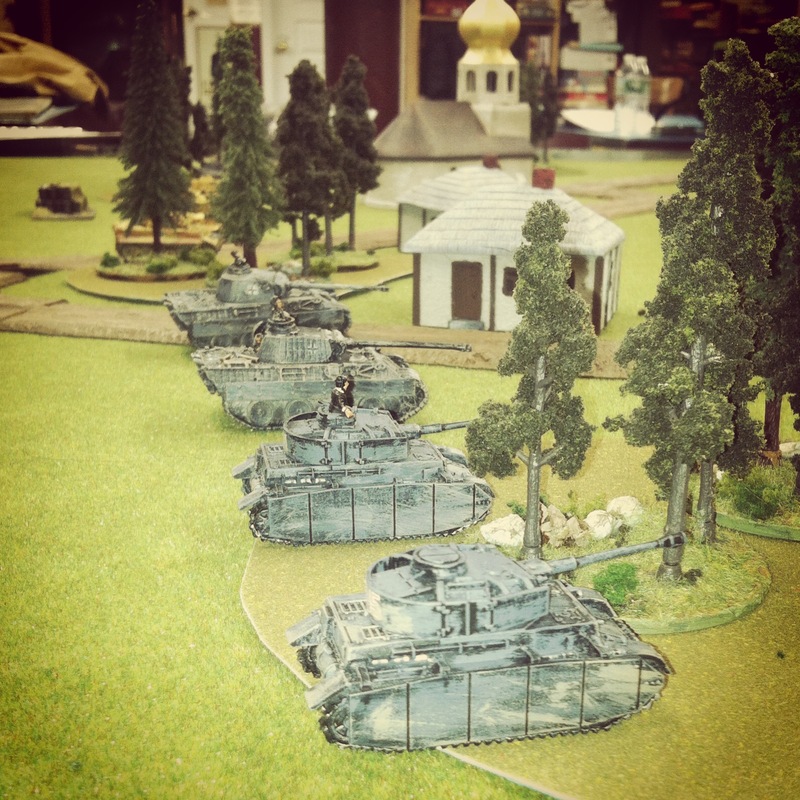 With a few weeks of planning, I helped round up 10 players for the day’s game. 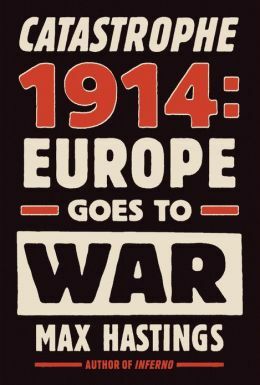 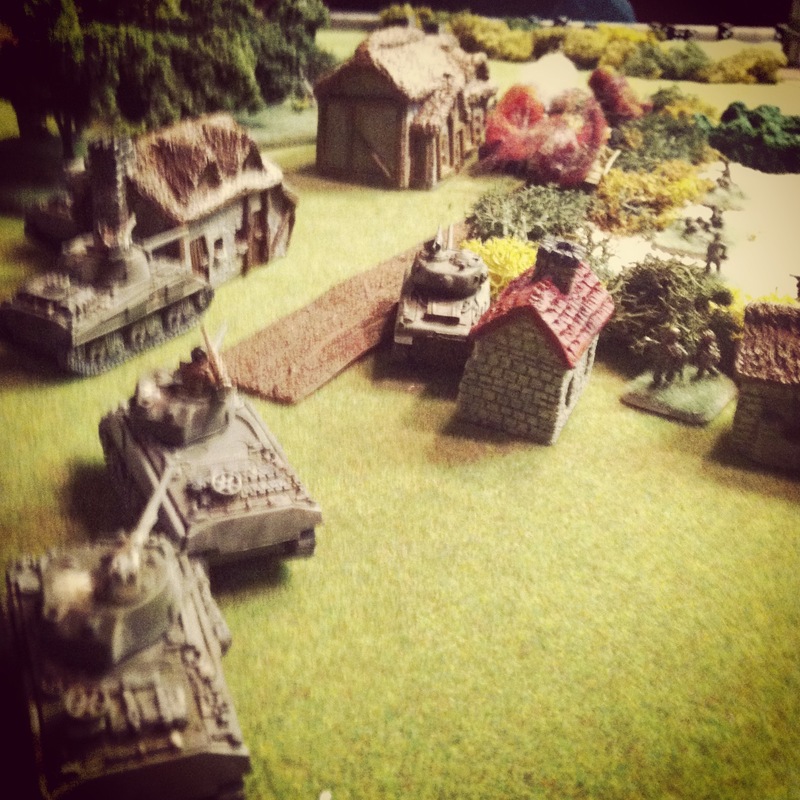 We settled on two games from the late war, one each on the Eastern and Western Front. 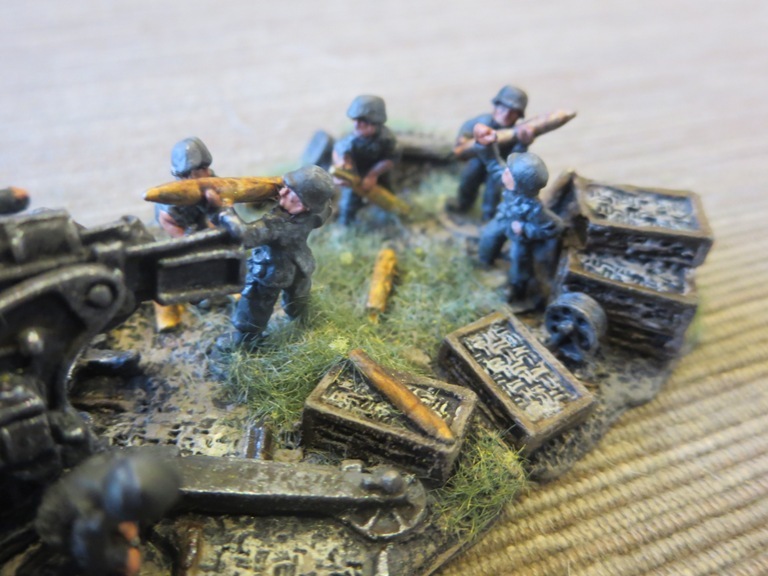 The Western Front game featured two teams of two players each on the German and US sides with each team running 3000 points on a 4’x8′ table. 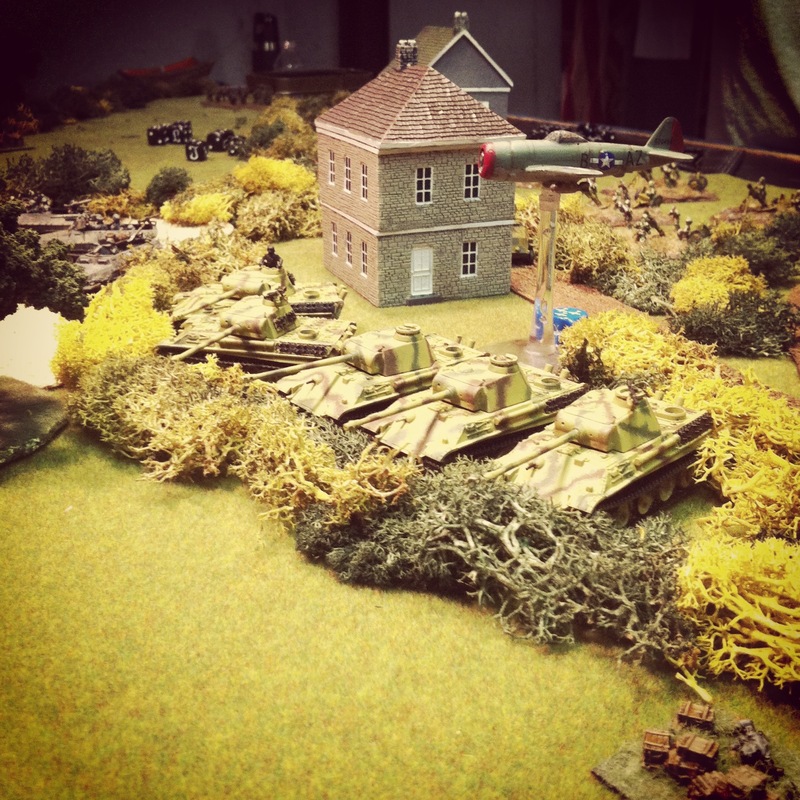 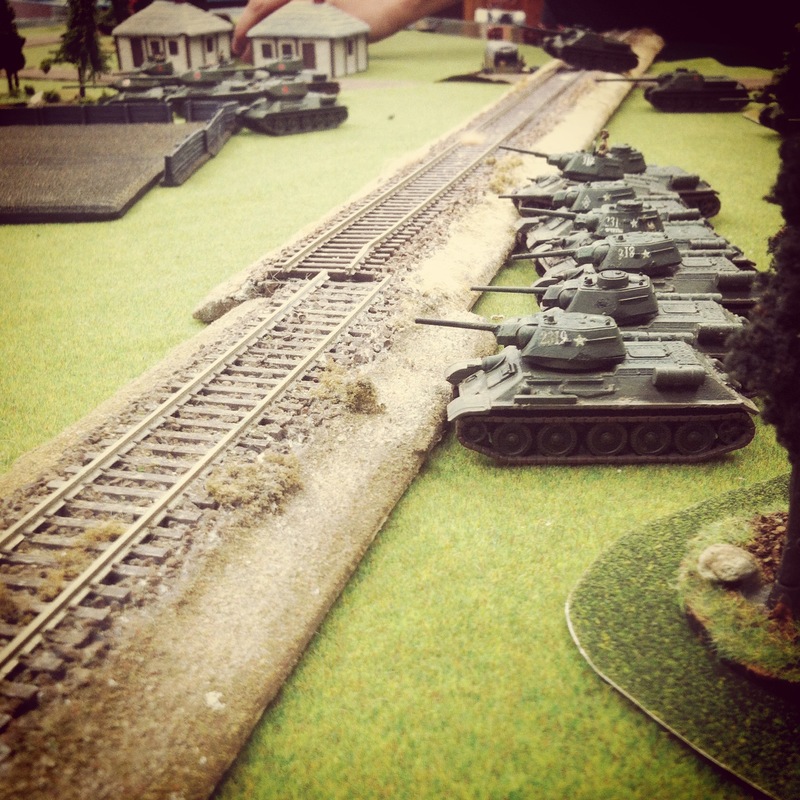 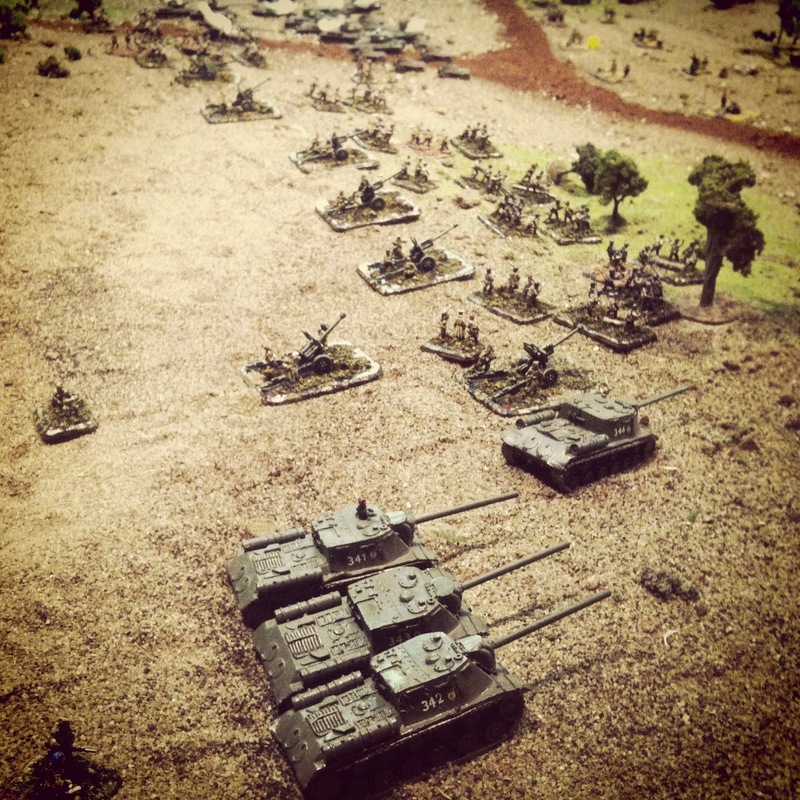 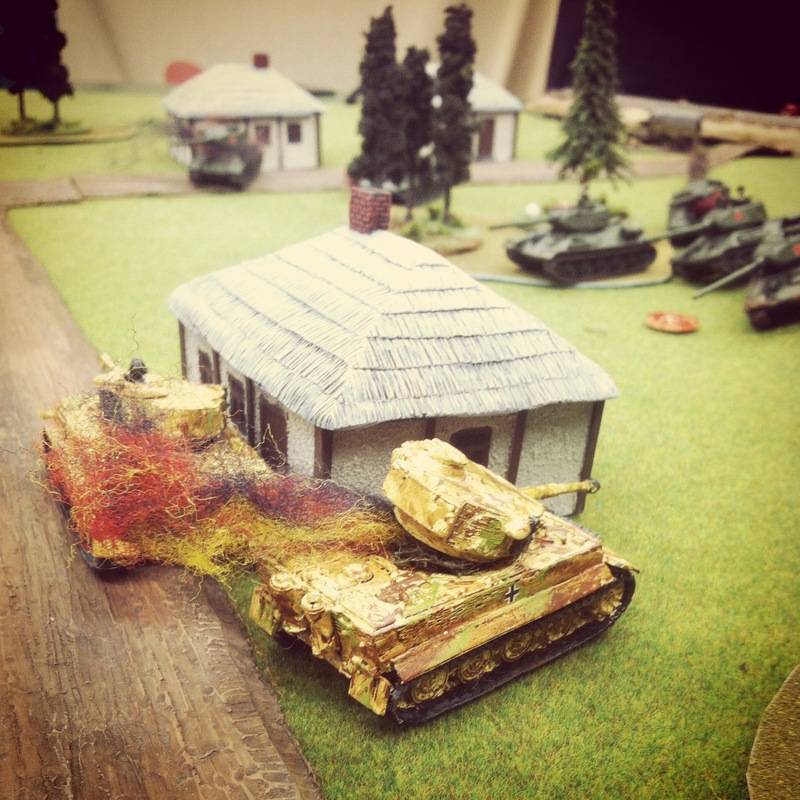 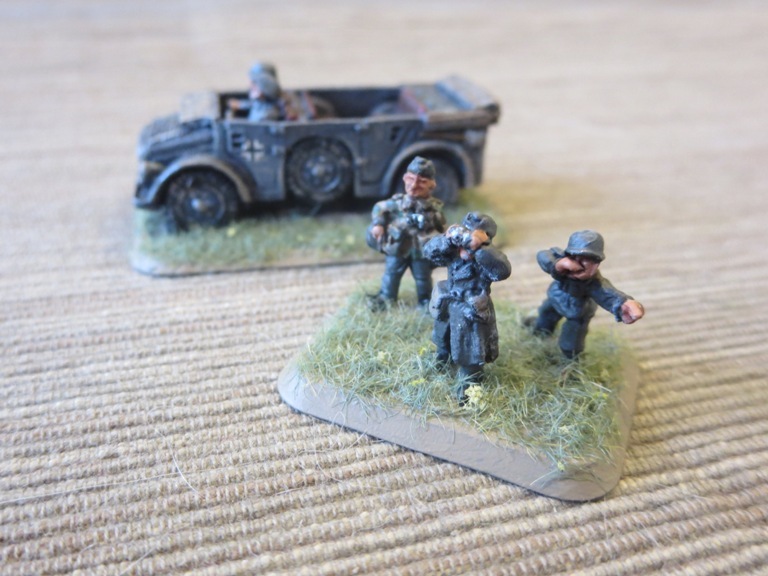 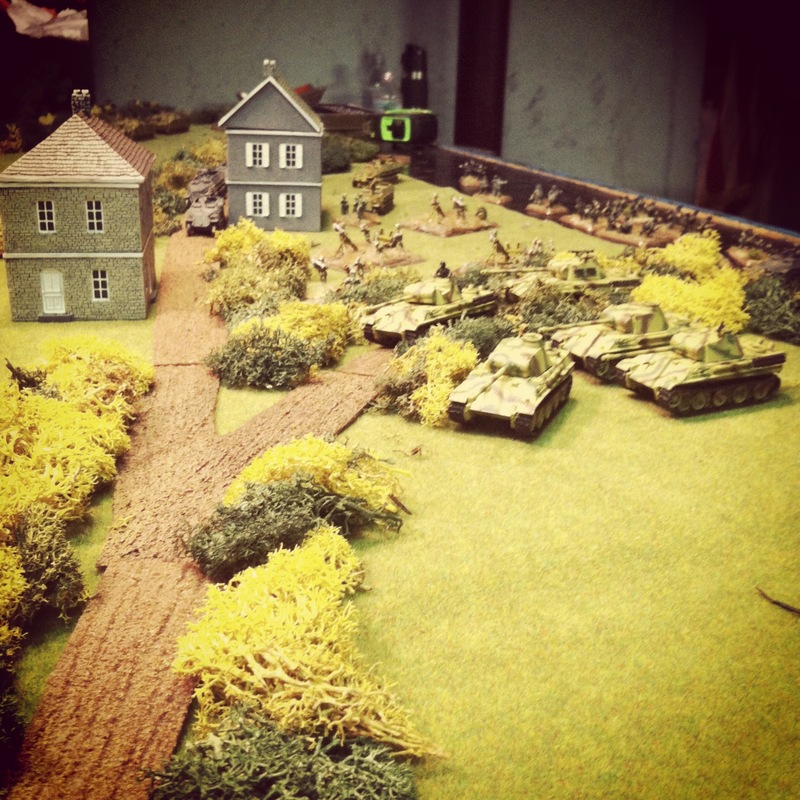 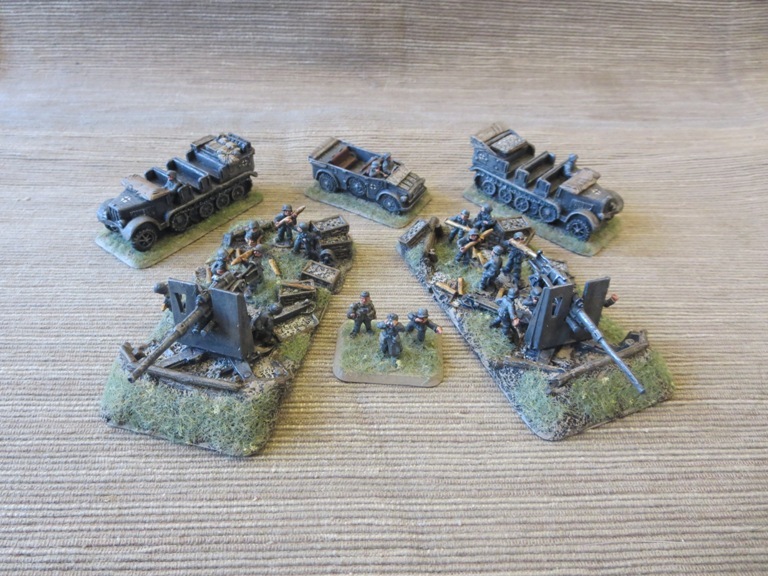 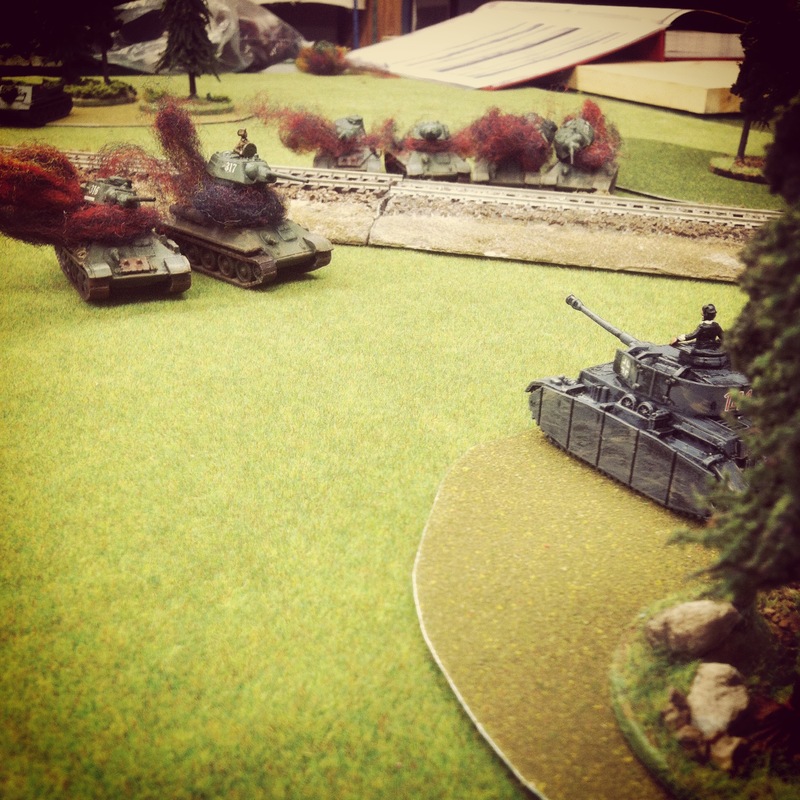 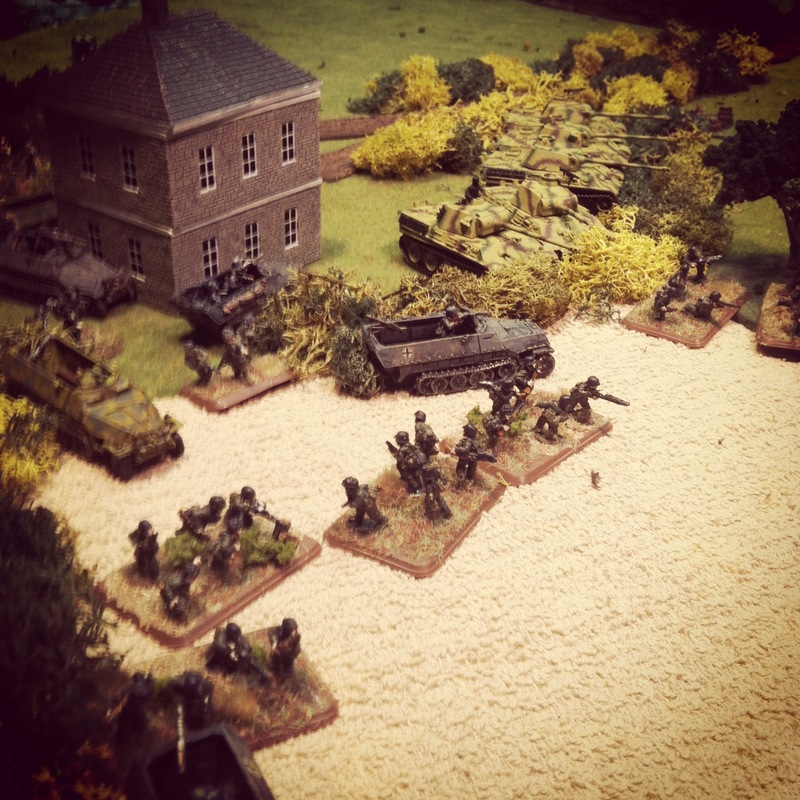 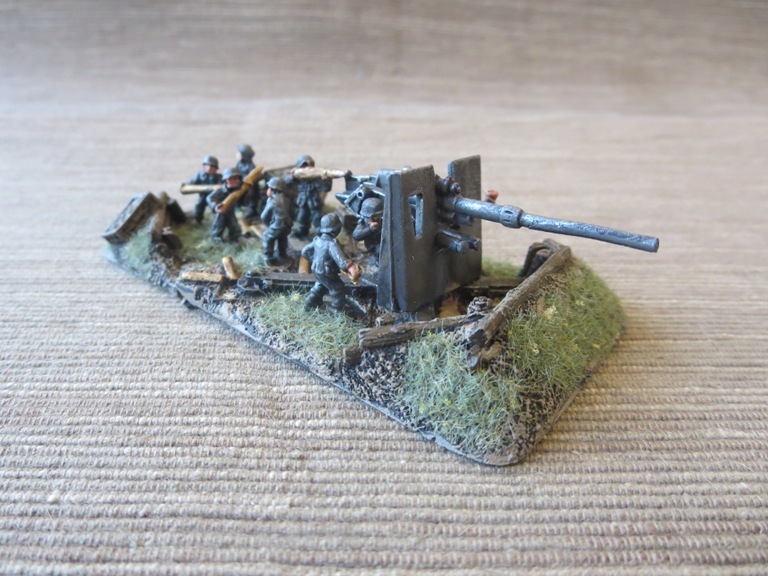 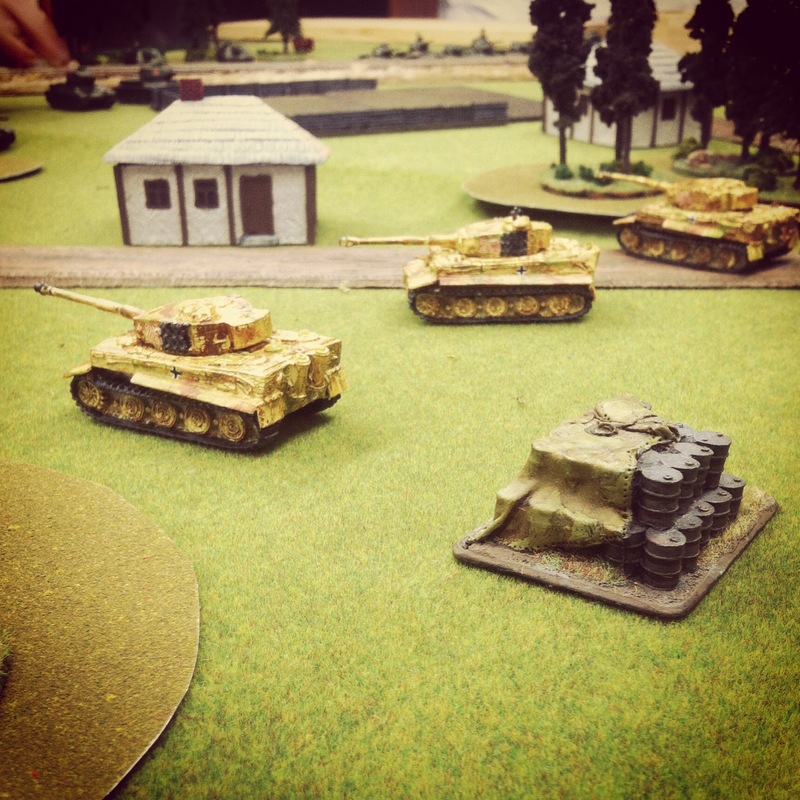 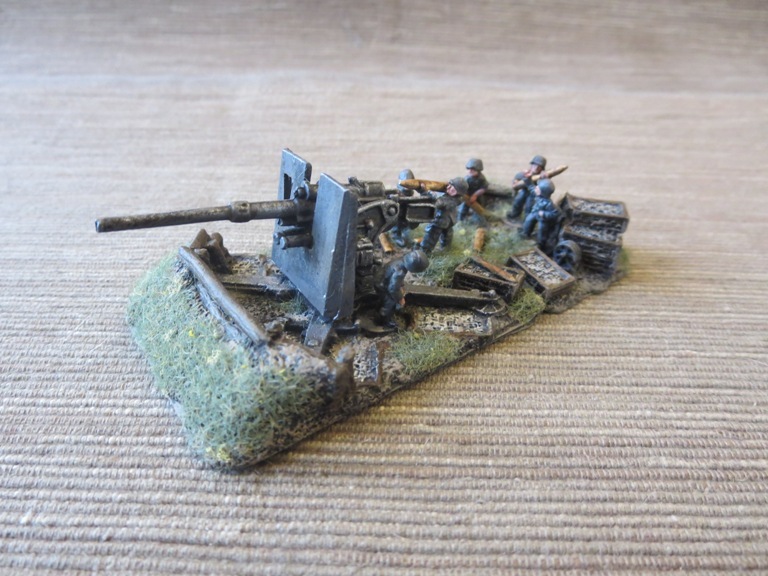 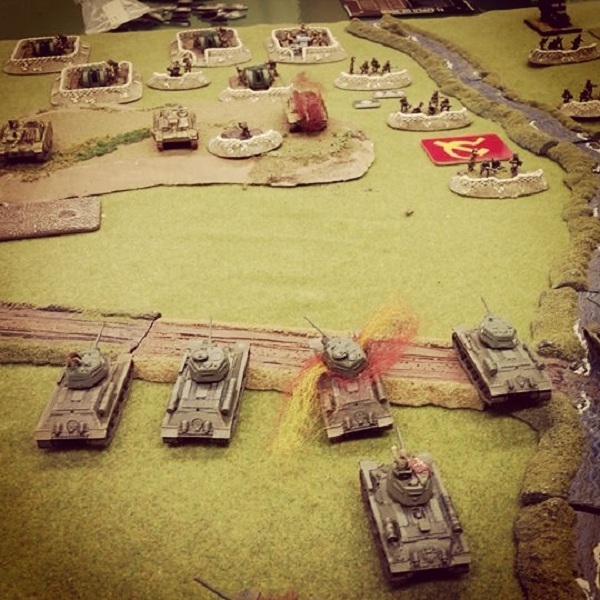 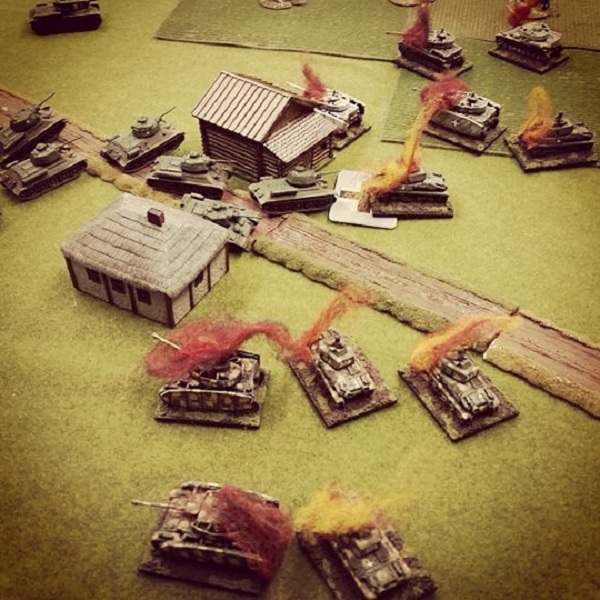 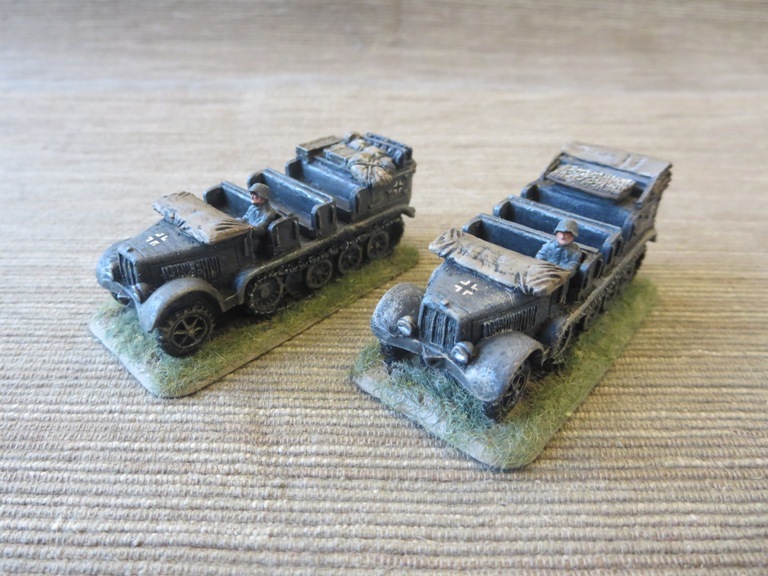 On the Eastern Front, two three-player teams squared off in a tank-heavy scenario on one of the club’s famed sand tables with each team compromised of 5000 points. 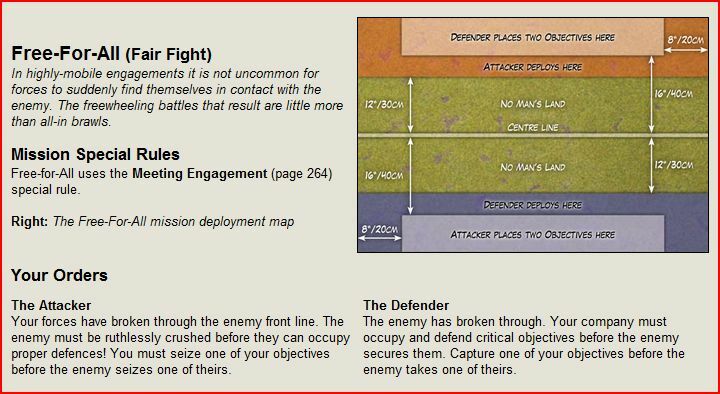 Each game featured endgame objectives and were slated to run to eight turns. 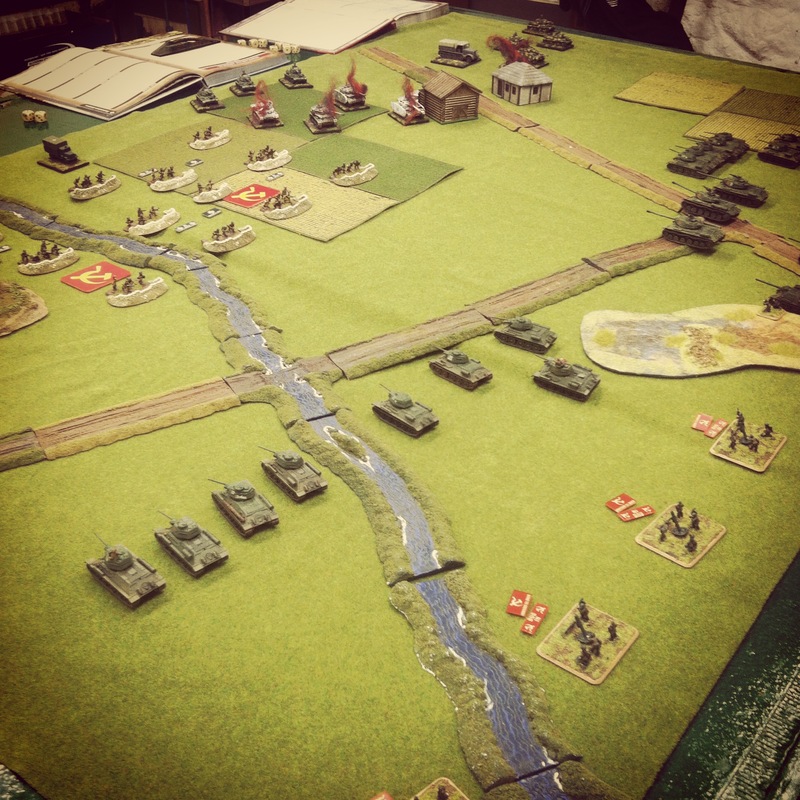 With games these large, we were up for a very long day of action. 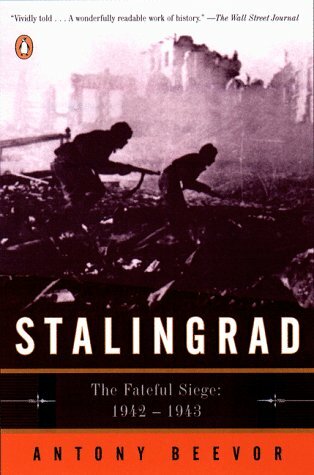 On the Eastern Front, the table was wide open with widely-sloping sculpted sand hills, small copses of trees along each long side and a Y-shaped road bisecting the table. 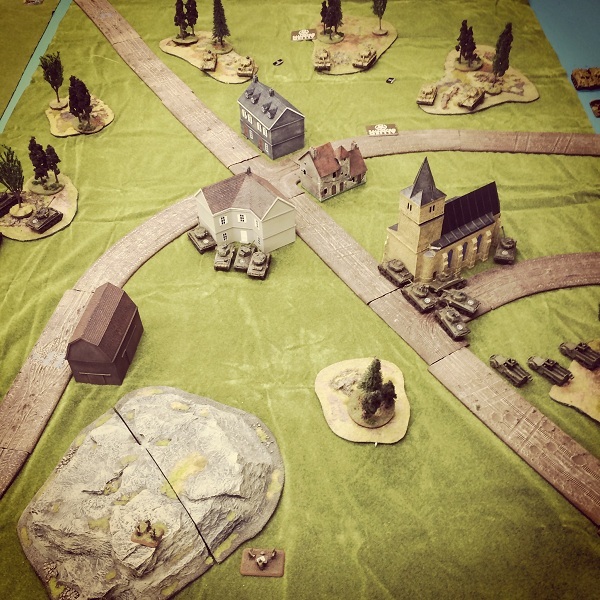 I spent the day riveted to my own game on the Western Front table, but the German and Russian armor spent the day pounding away at each other. 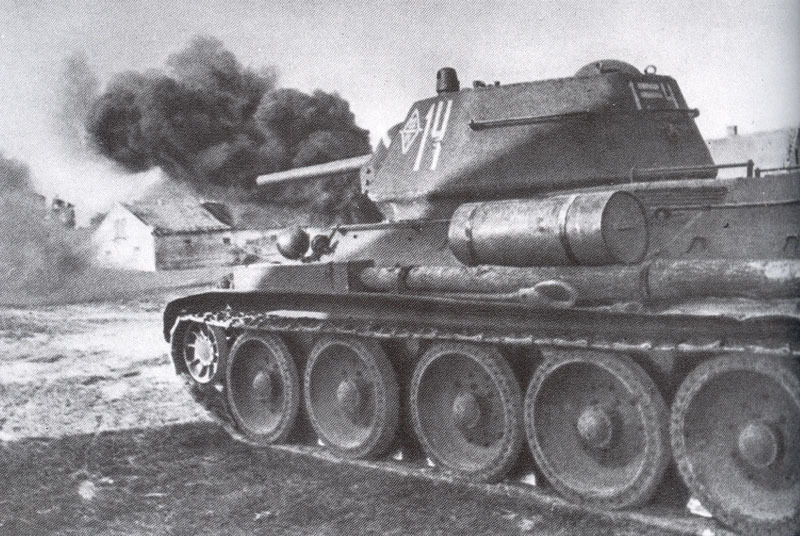 By mid-day, things had looked pretty good for the Germans as many destroyed Russian tanks stood smouldering midfield. 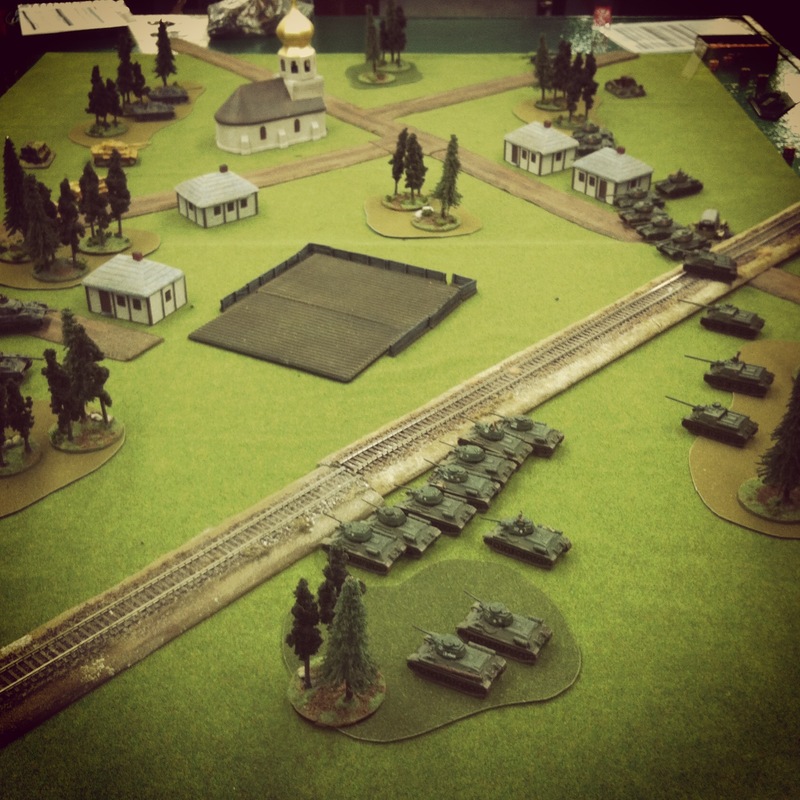 All that changed in the latter half of the game as the Russians rallied to victory. 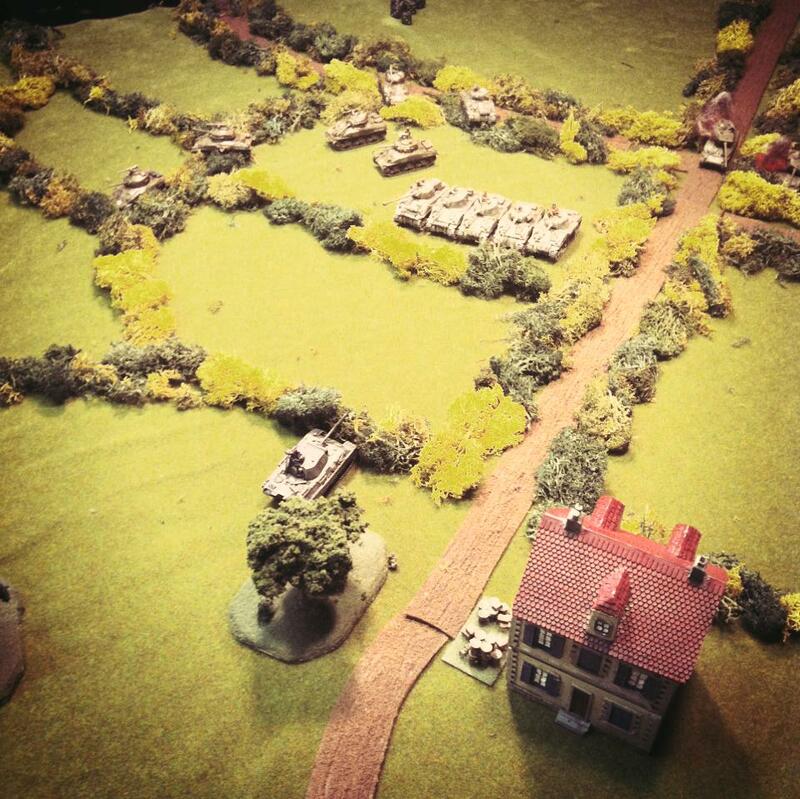 My game on the Western Front featured a generic French landscape cut up into winding narrow roads lined with the notoriously difficult bocage hedgerows which stymied both sides in the engagements fought in the region throughout 1944 and 1945. 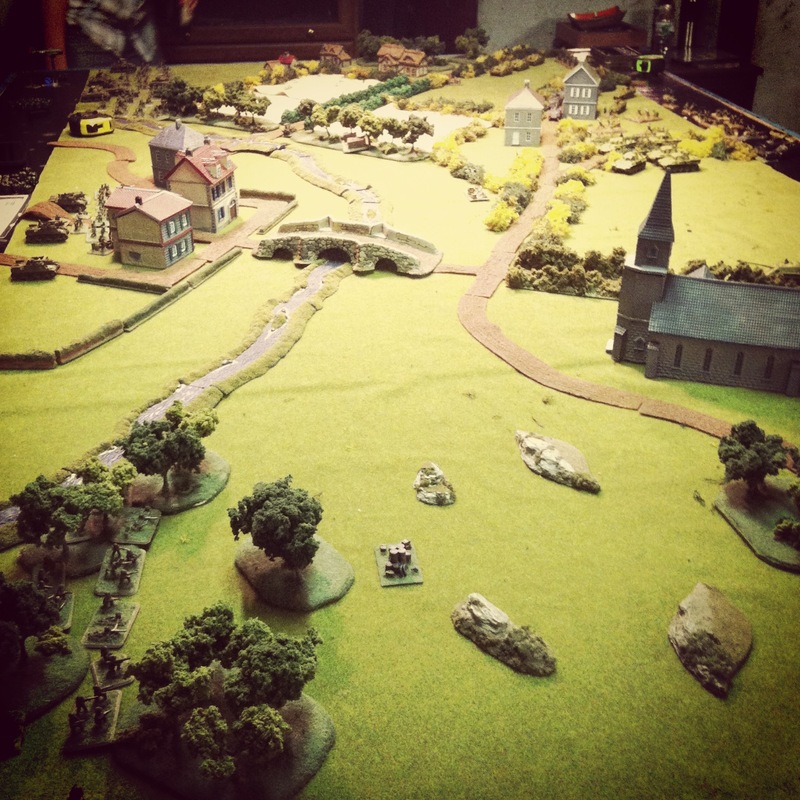 A church stared across the board to a stone bridge crossing a narrow stream to a small village. 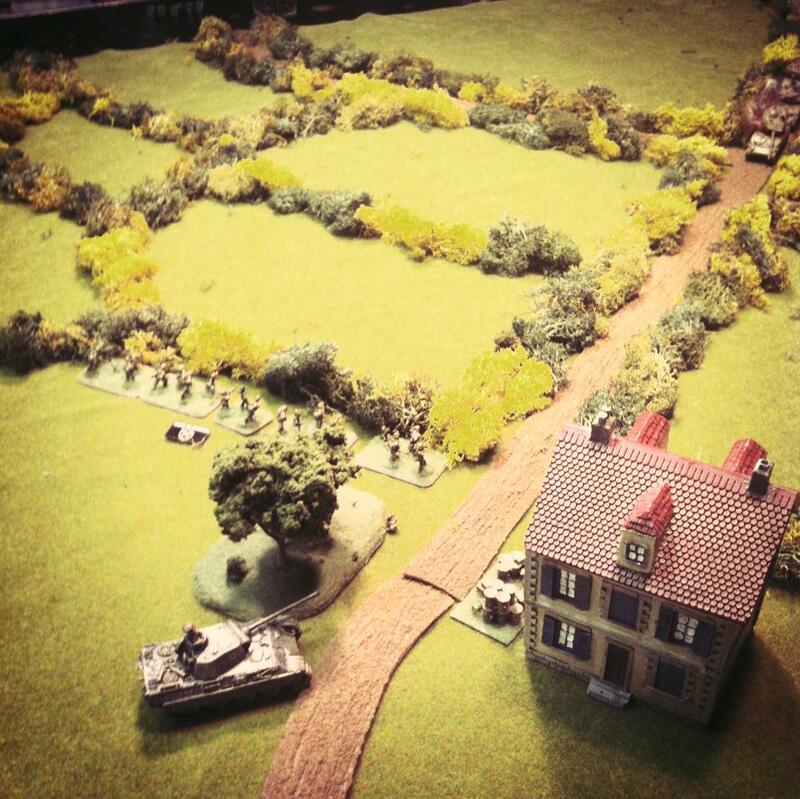 On the other end of the table, a small farm was set beside two wheatfields with two more rural stone houses in the near distance. 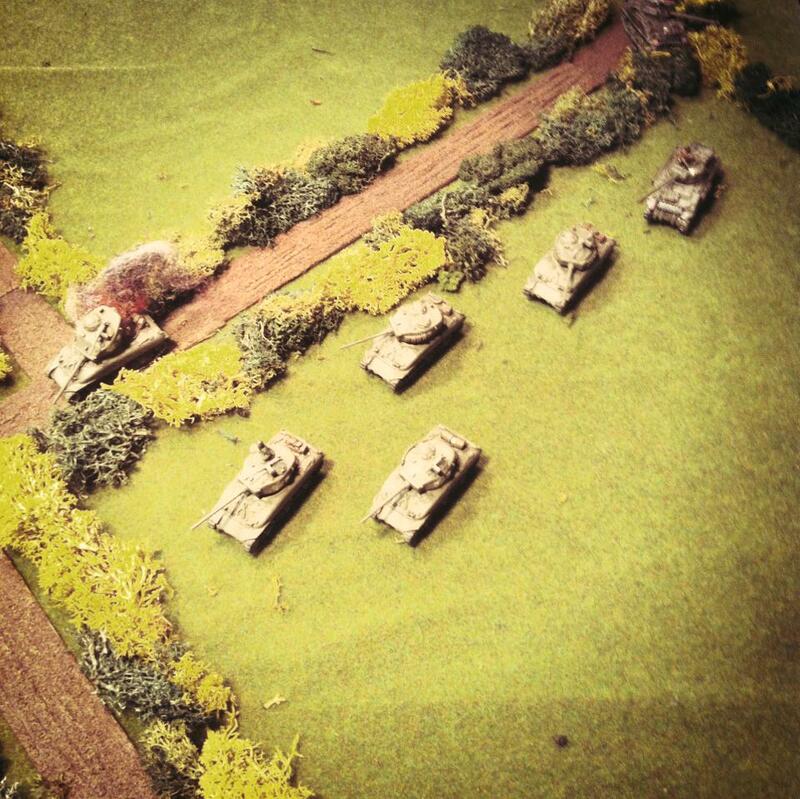 Our US plan was to place the majority of our armor on our right flank, supported by mobile infantry deployed in a small wood. 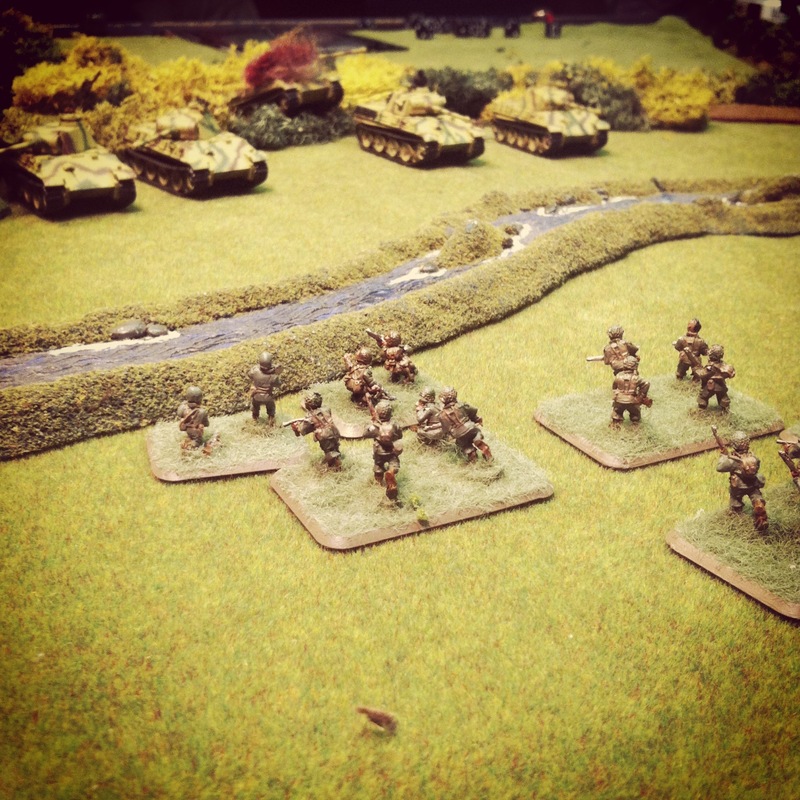 On the left flank, the US Airborne deployed just outside the wheatfields with its small parachute battery to the rear. 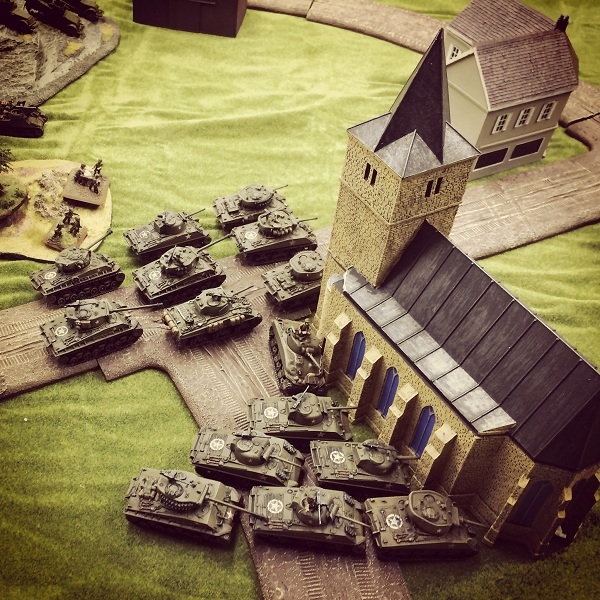 At the center of the board, our M7 Priests with their 105mm guns formed another battery while one lone Airborne platoon pushed to hold the buildings in the town with a vantage covering the bridge. 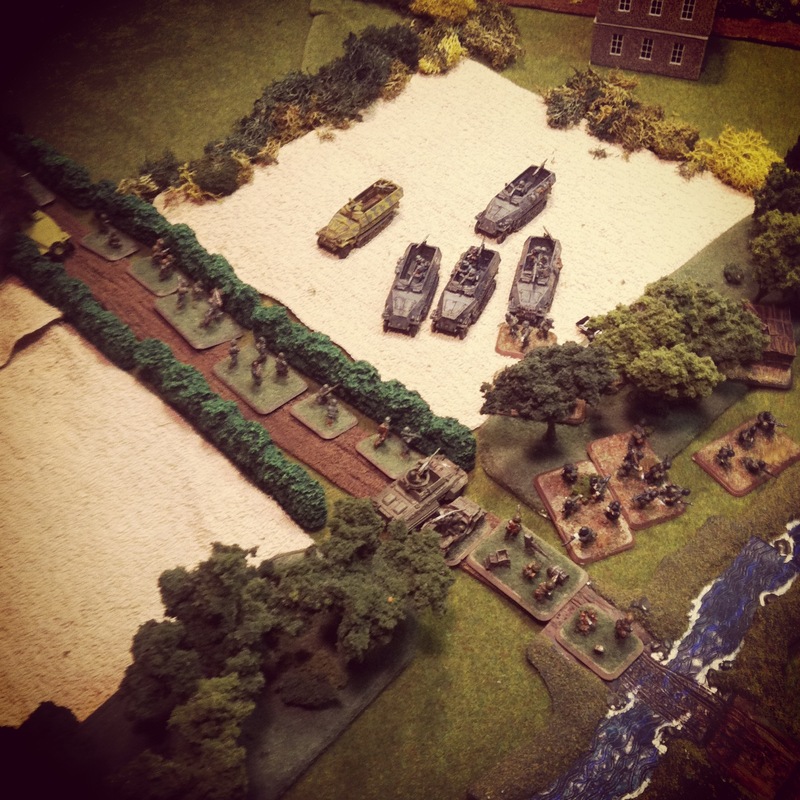 The game started poorly for the Americans as the Germans quickly pummeled the American Shermans and kept the infantry hiding in the woods. 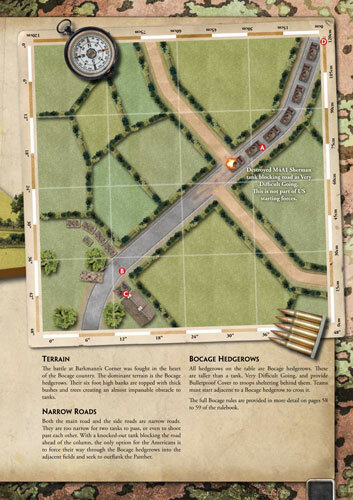 In the center, the US infantry struggled to occupy the buildings as the Germans quickly rolled five exceedingly threatening tanks behind a row of bocage overlooking two objectives. 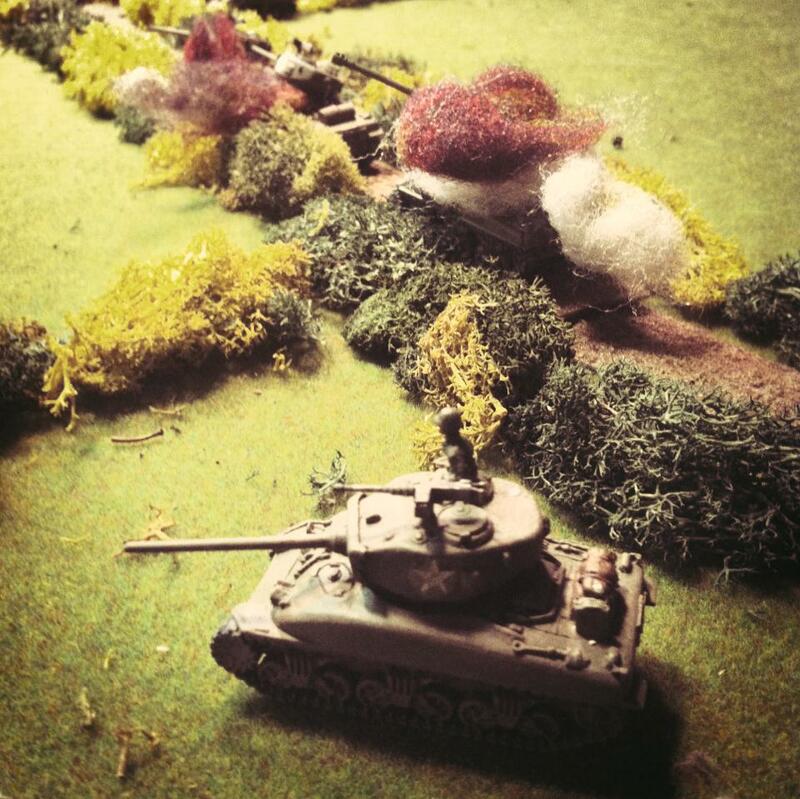 The American’s P7 Thunderbolt was likewise ineffective through the first few turns of the gaming, missing all targets except on German tank which burst into flames while bogged over a hedgerow. 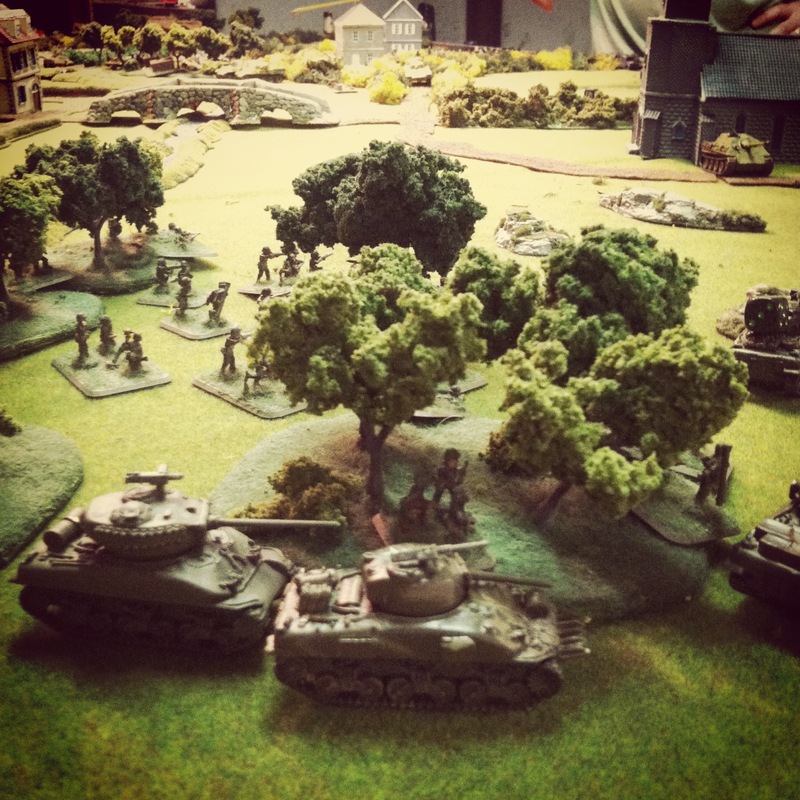 The fight on the American left went better from the start as the US Airborne filled the wheatfields and headed for the hedge and road beyond. 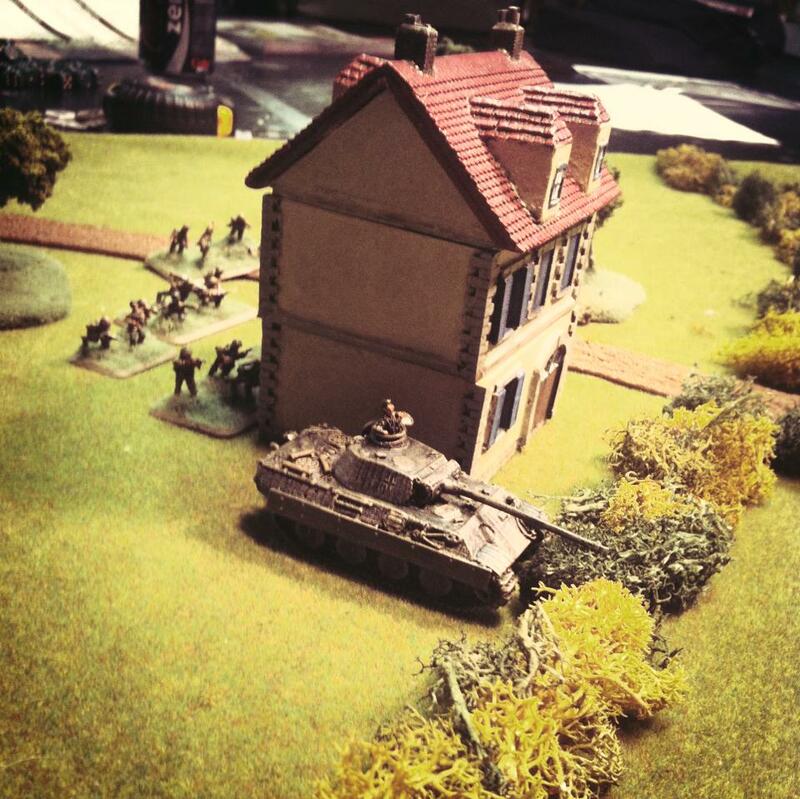 A brief scare from a platoon of German Stugs, a row of halftracks and a platoon occupying the farmhouse was solved with our trusty American Shermans. 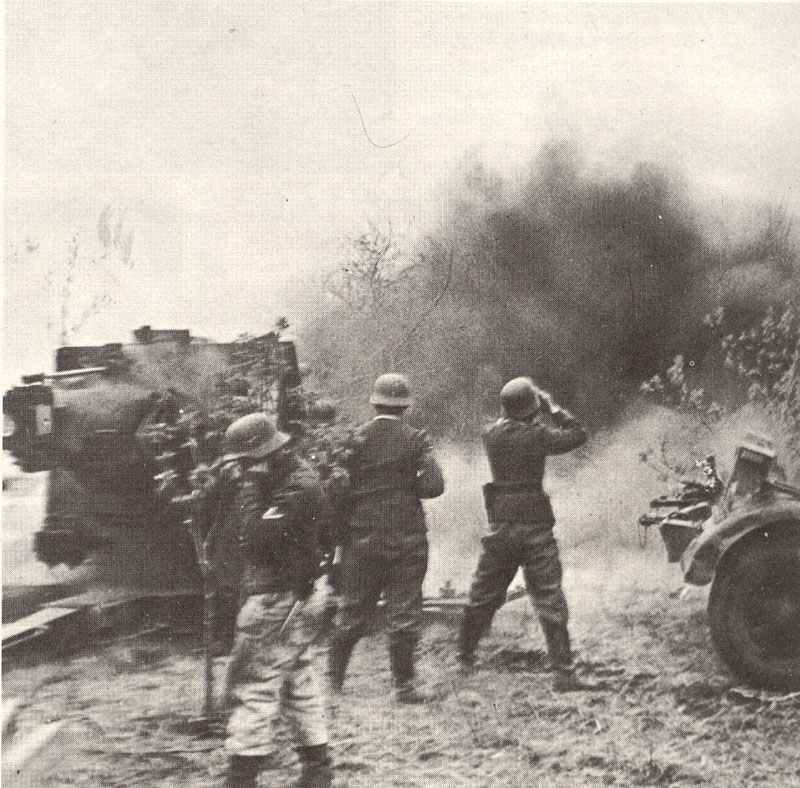 With a combination of artillery bombardments, heavy fire from the US tanks and some shooting from the advancing Airborne, the crossroads in front of the farm was turned into a smoking mass of destroyed German armor. 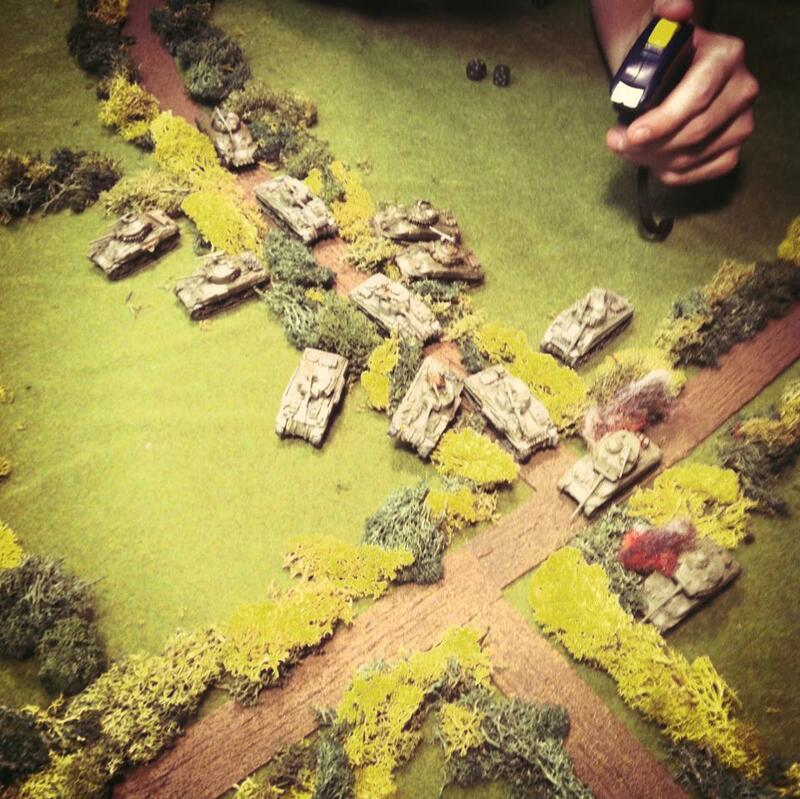 Just as the German right flank stood wide open to the rolling Shermans, the command tank bogged in the woods where it and its entire platoon would remain for the rest of the game. 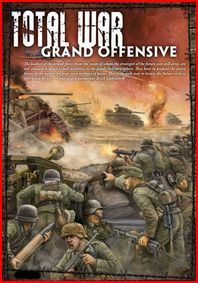 By mid-game things looked good for the Germans, but the resilience of the Americans would prove to be the edge in the second half. 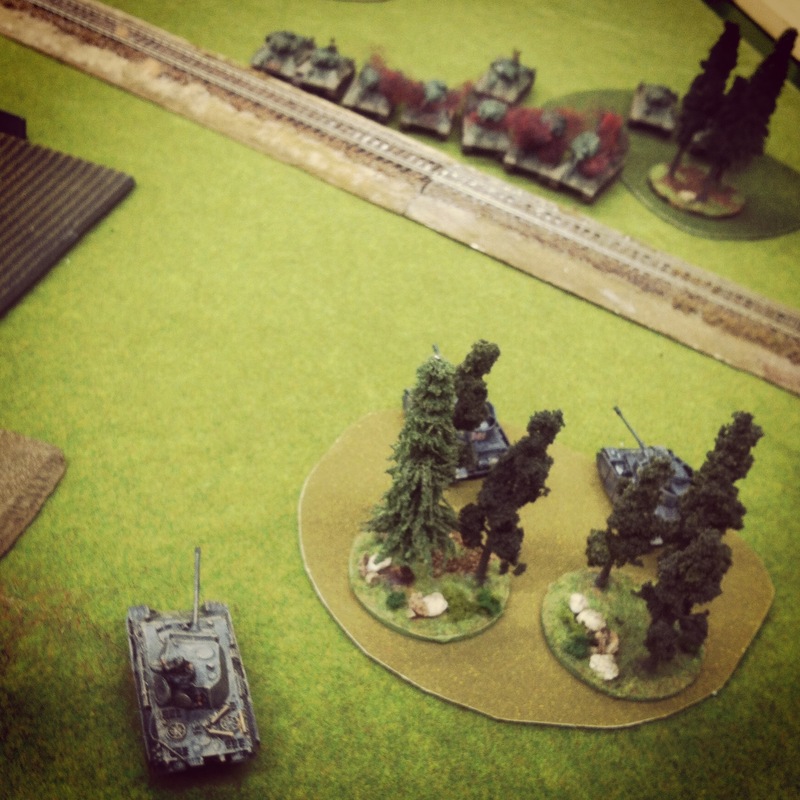 The American armor was pretty torn up on our right flank, but the US kept making some remarkable morale rolls to stay on in the fight with the dwindling German tanks. 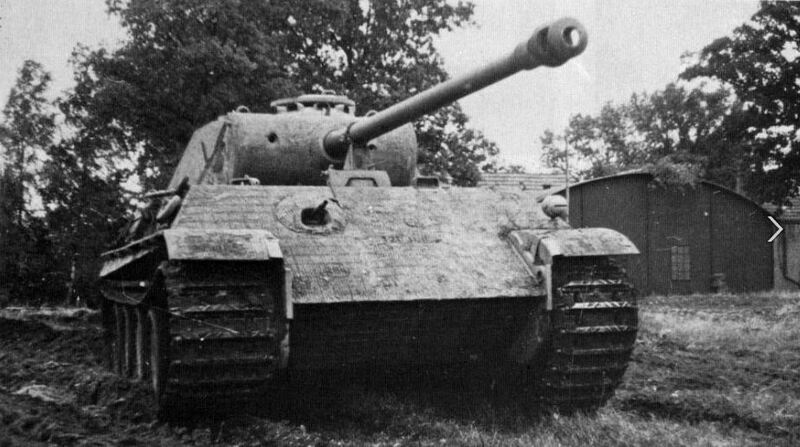 At the center, the Priests had lost one of their guns but snuck back into cover to continue taking direct shots across the river at the remaining German armor. 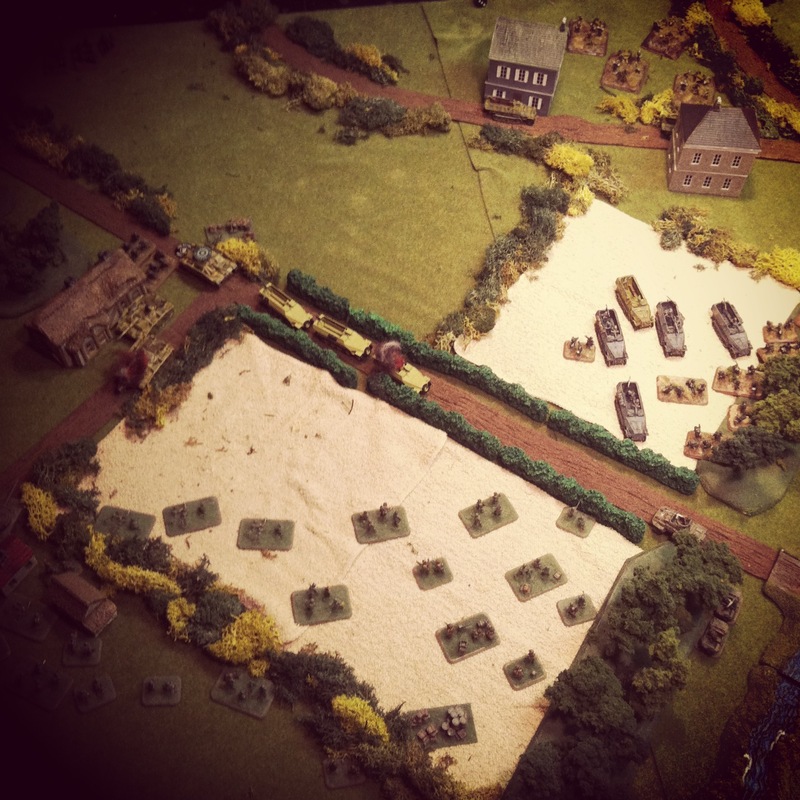 The US Airborne platoon occupying the town’s buildings risked a run toward the river, taking casualties along the way despite the smoke covering the German line on the far side. 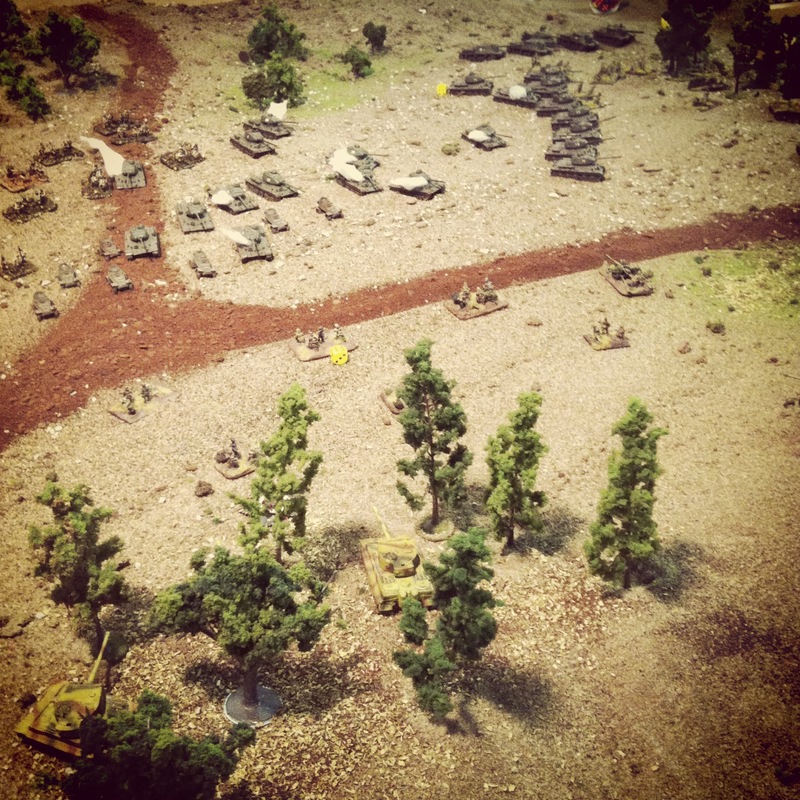 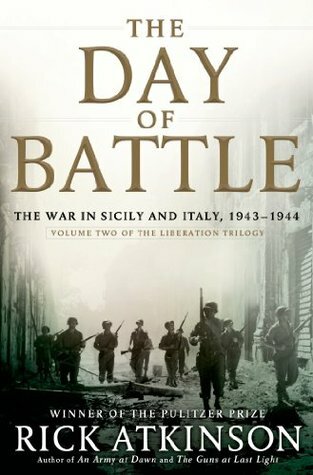 The fight between the wheatfields and adjoining treeline saw the Germans and Americans whittling each other down. 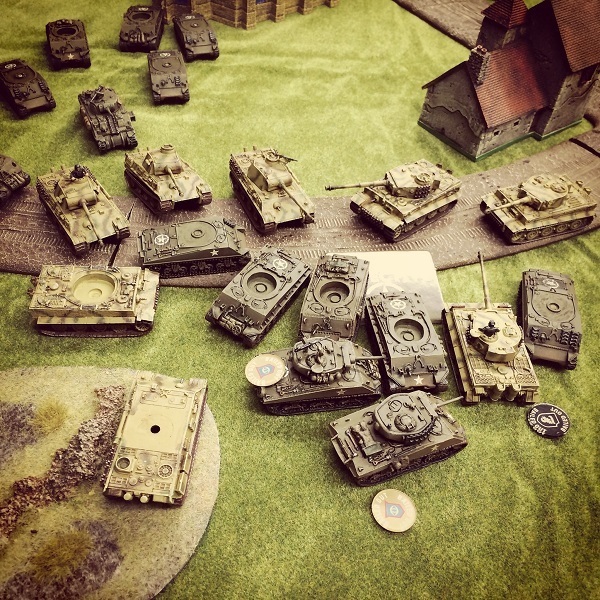 In the final turn, the 101st Airborne finally got in close enough for a tank assault, destroying one tank and pushing another back from an objective. 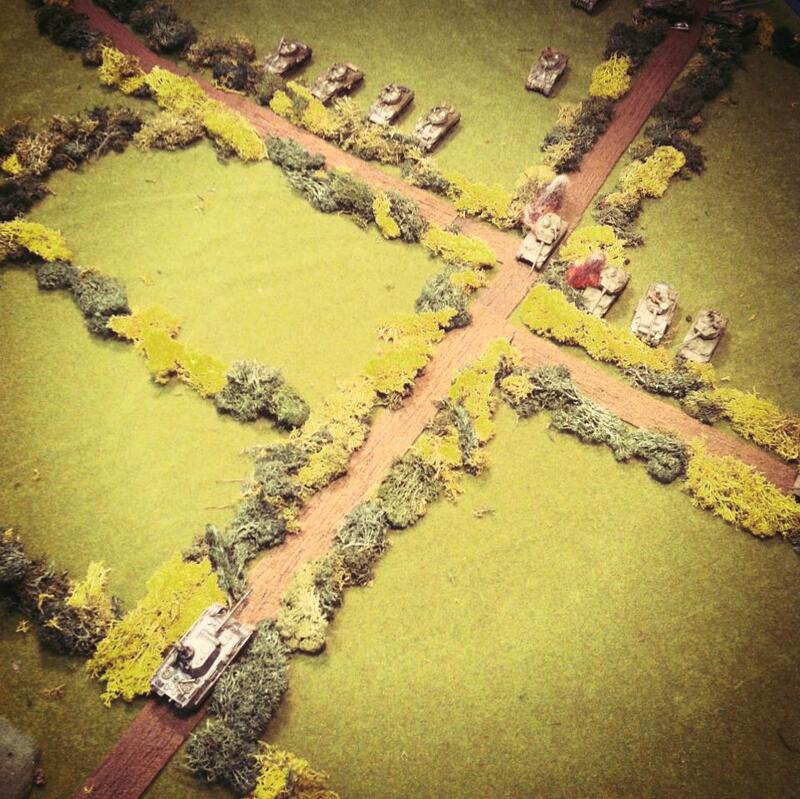 It was a bloody fight, but in the end it was an American victory with four of six objectives held. 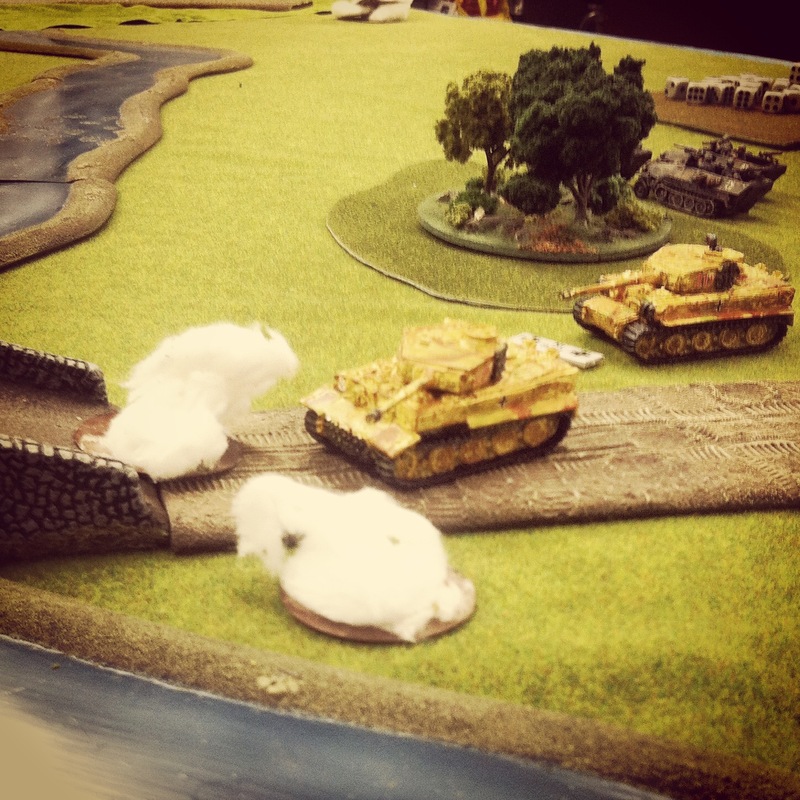 On both tables, it had been a good day for the Allies. 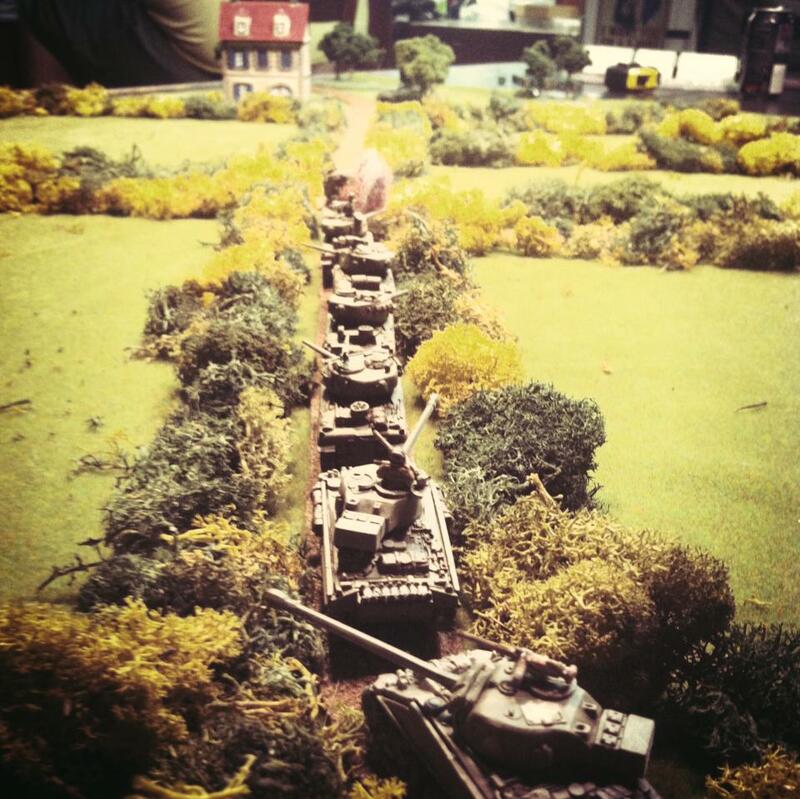 And it was a long one, too. 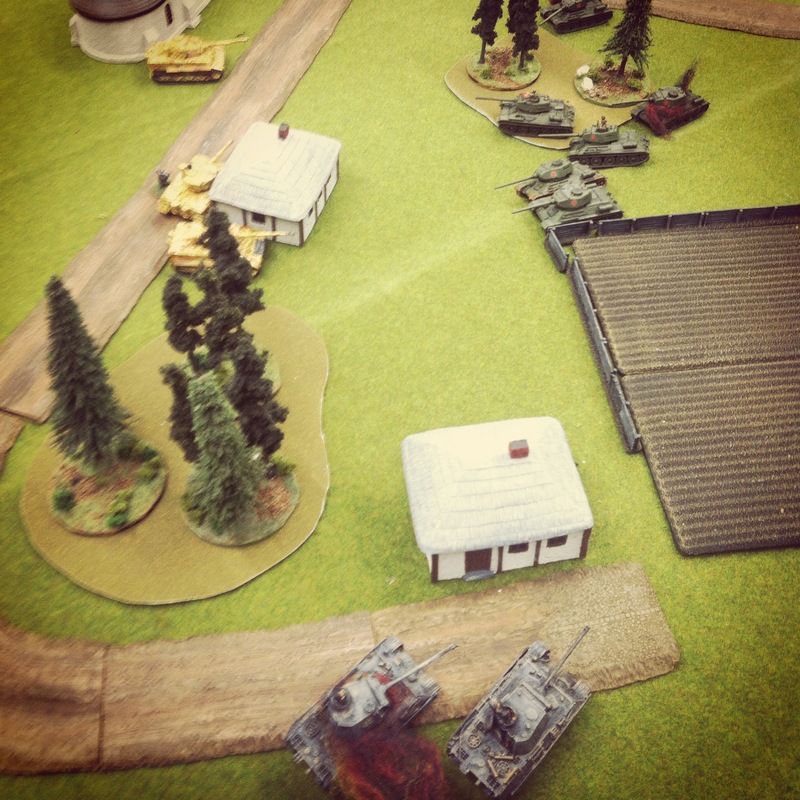 With a nearly eight hours of gaming and only brief breaks to grab a drink from the fridge up front or a hotdog off the grill out back, the two games had been exhausting but enjoyed by everyone – win or lose. 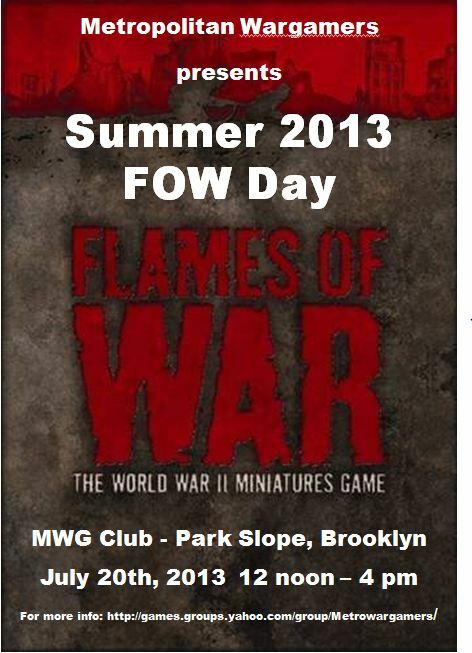 That’s the kind of spirit we at the club experience every week, and already there’s some after-action discussion about when we’re planning our next big Flames of War day in Brooklyn.